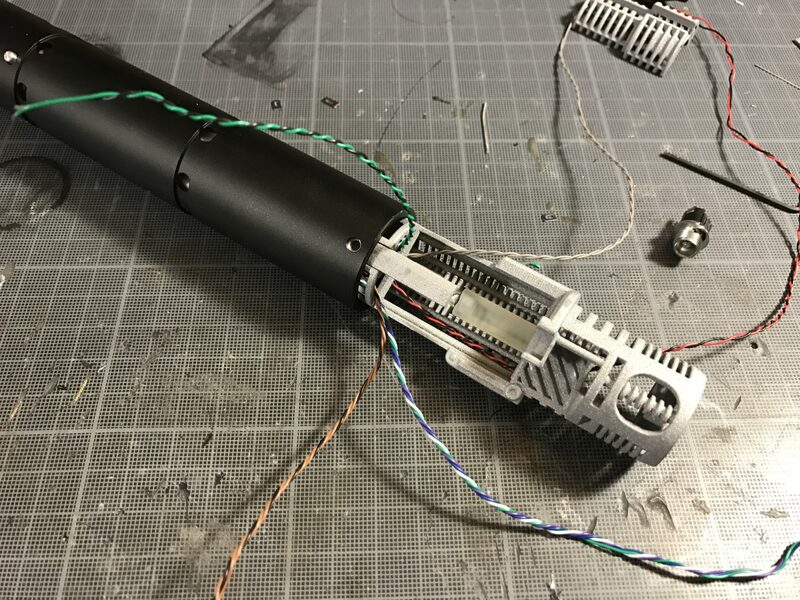 2 parts chassis, and optional simulated crystal chamber. 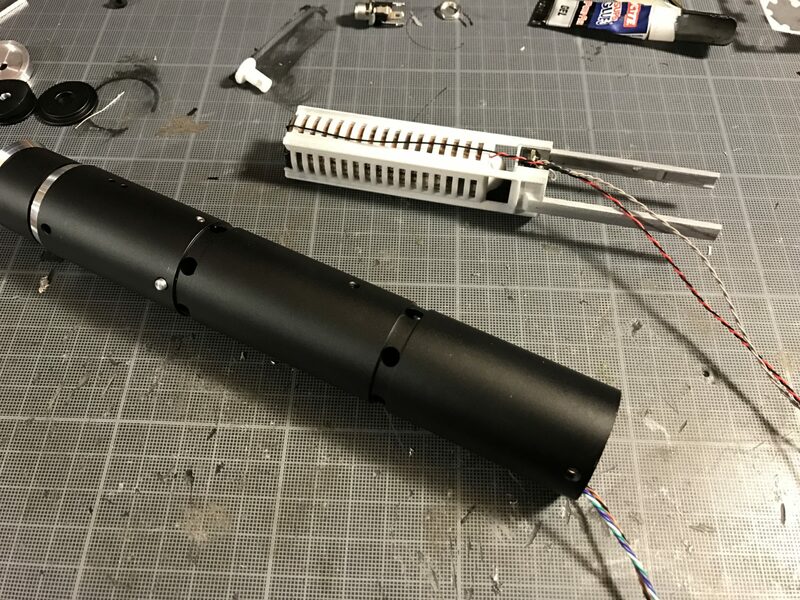 Each kit contains a battery/speaker module, sounboard module, soundboard cover and a kill key. 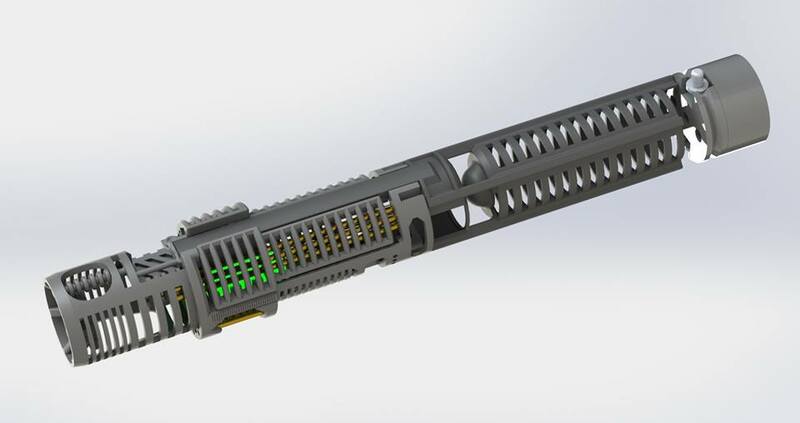 All-in-1 chassis + kill key. 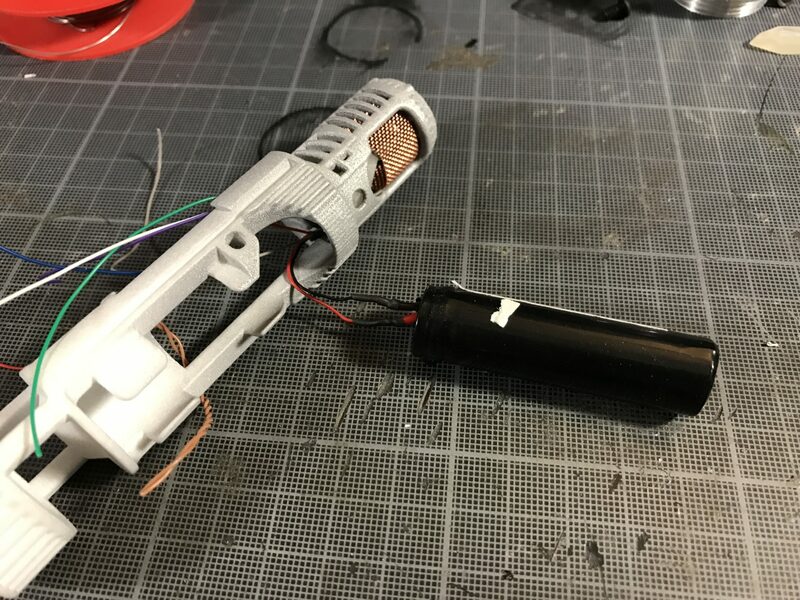 ⇒ Battery, see chassis model. 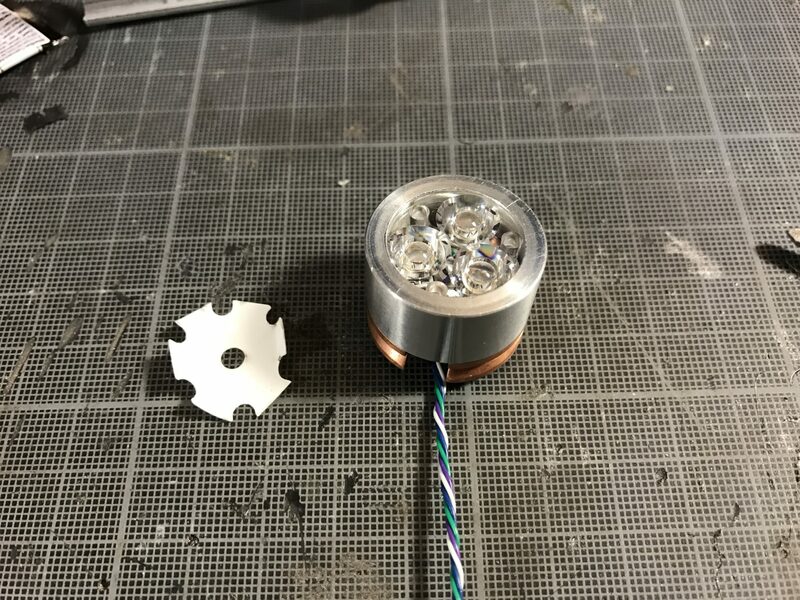 ⇒ Heatsink (1″ led module) is included with the hilt. 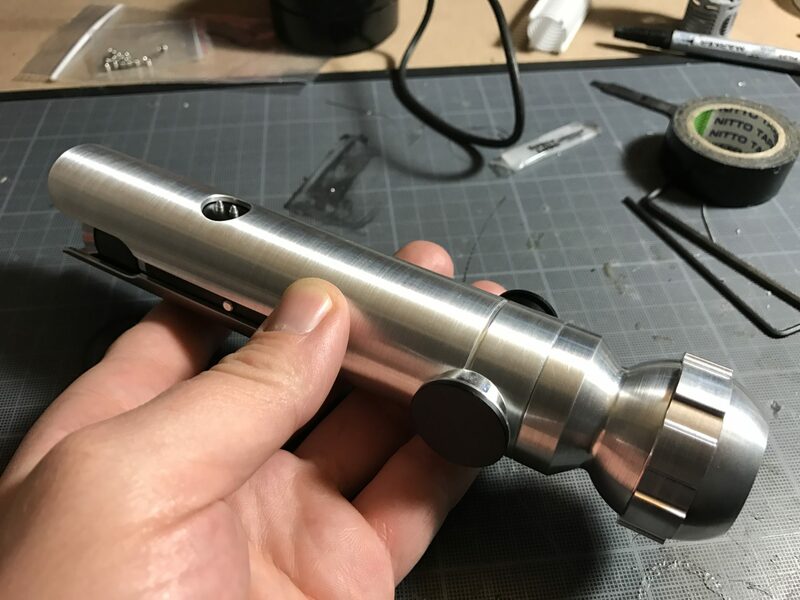 ⇒ Switches are included with the hilt. 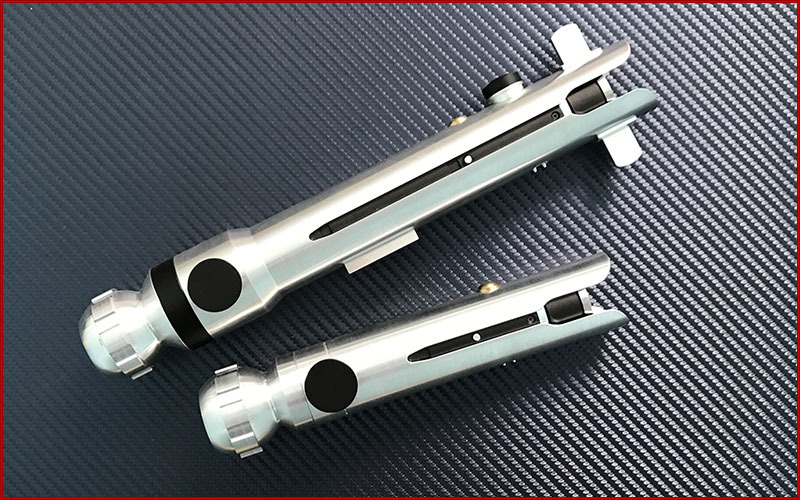 ⇒ 7/8″ OD Blades or 1″ OD blades. 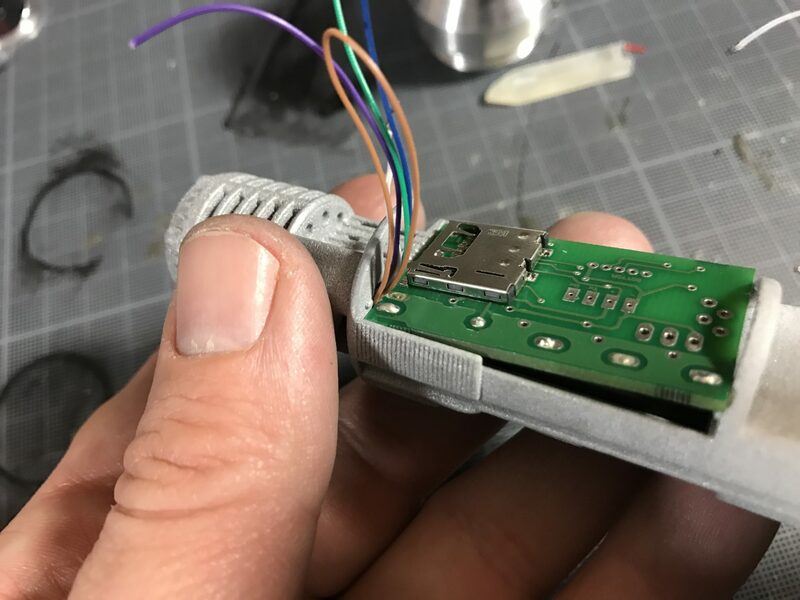 Note 1: These instruction will cover the Plecter Labs Prizm install, however we do not cover wiring instructions tho, please read your soundboard manual before starting the install. 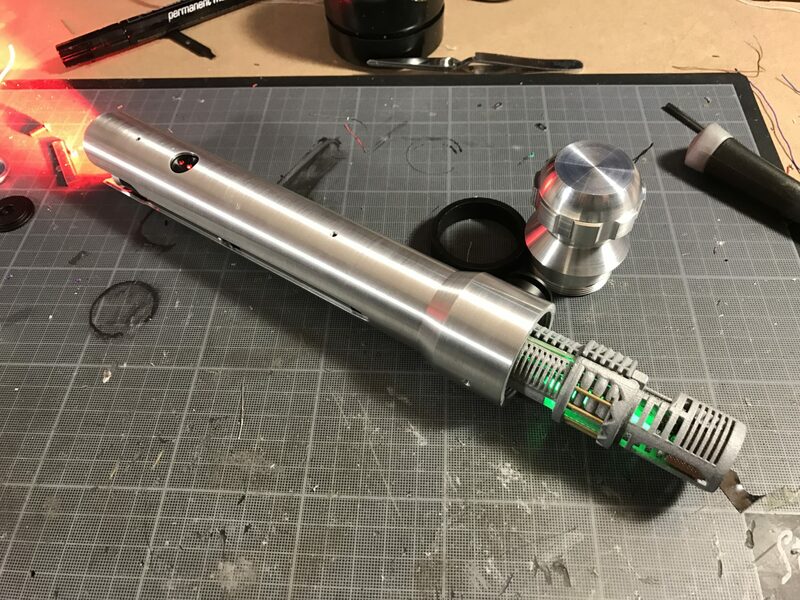 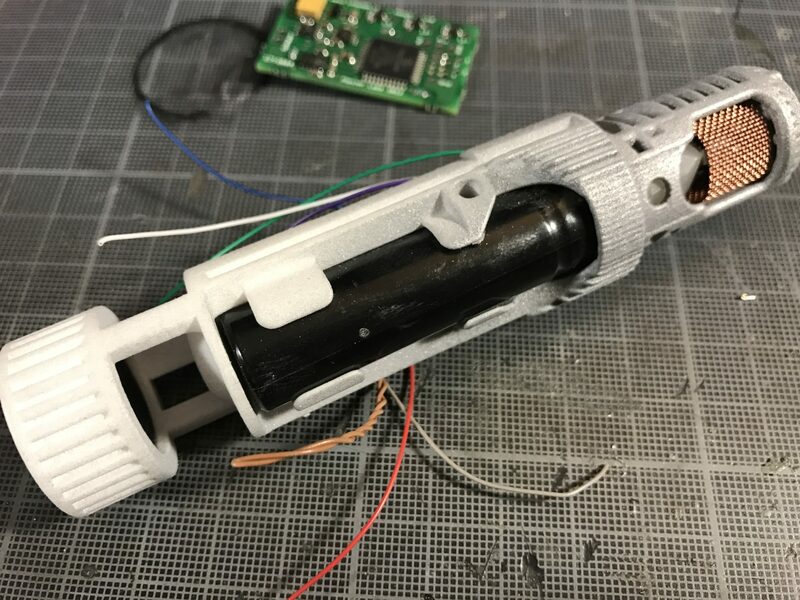 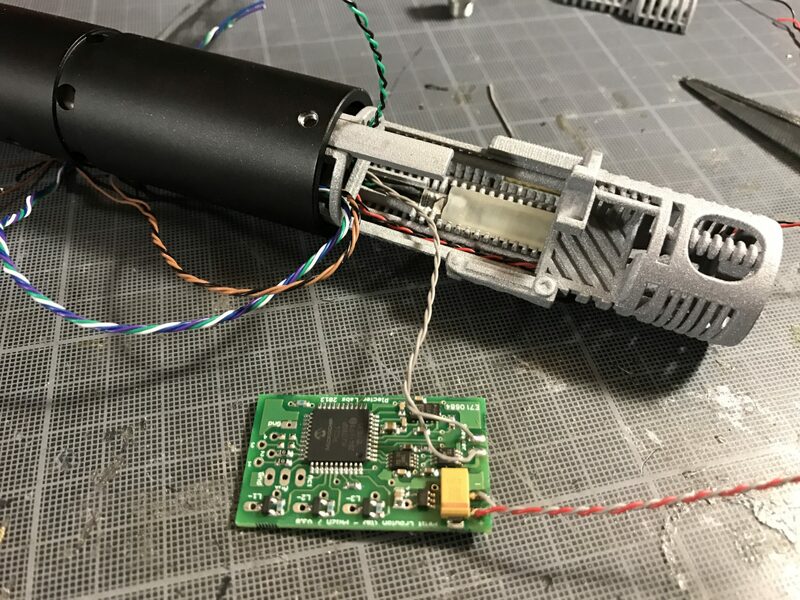 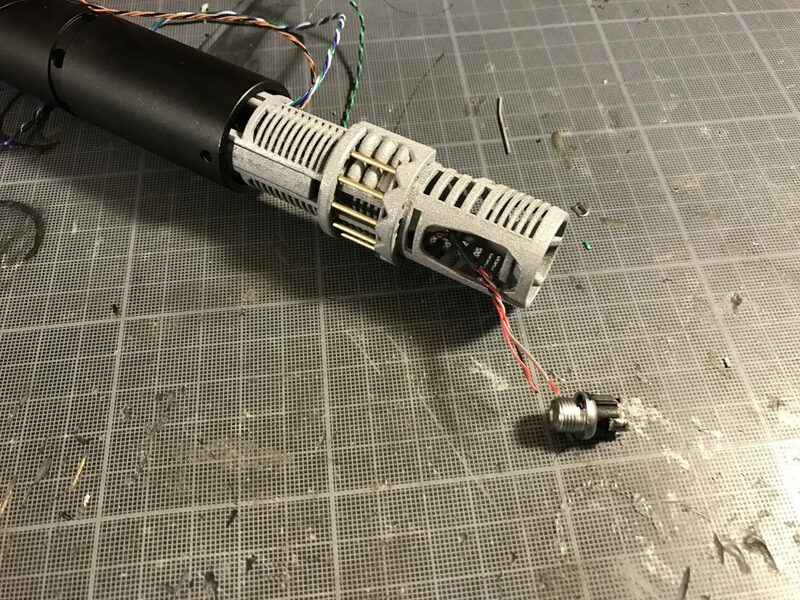 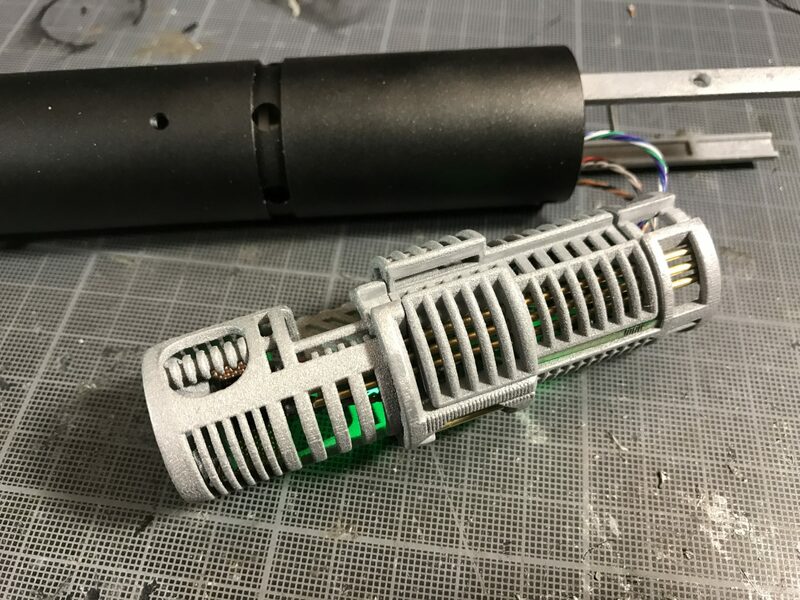 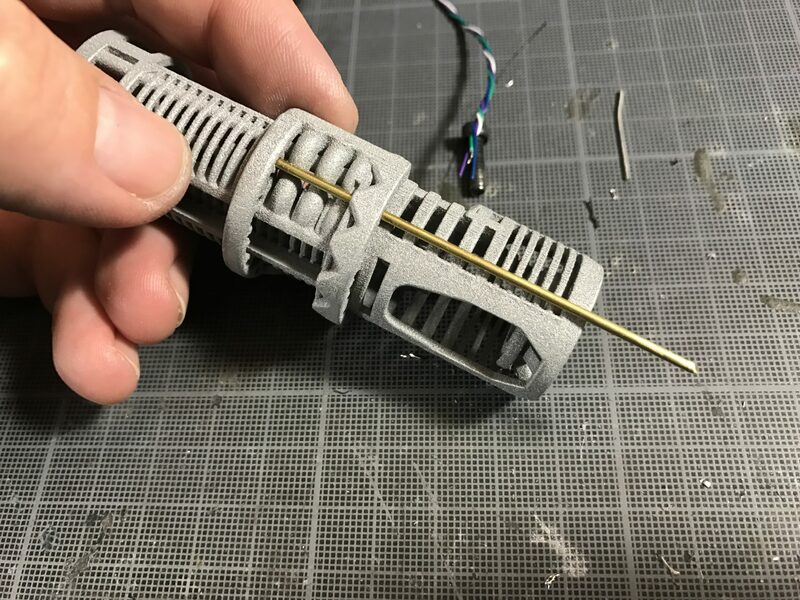 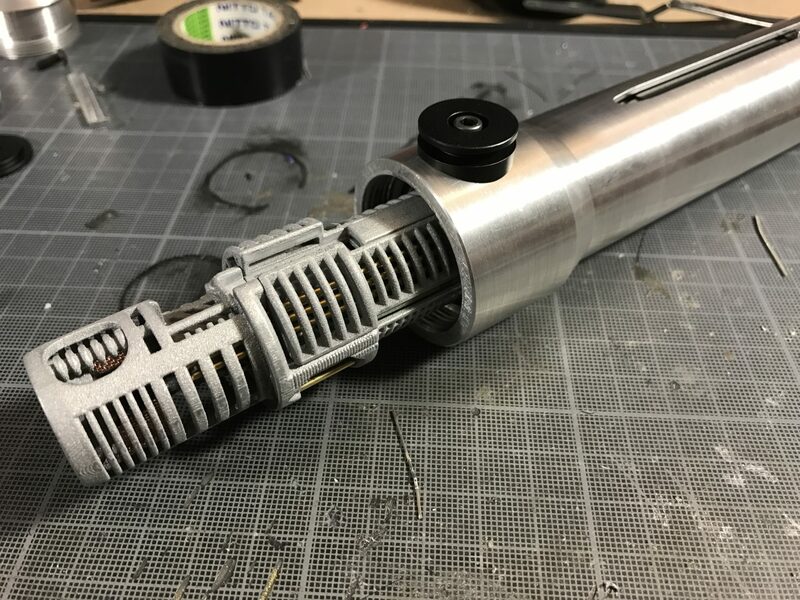 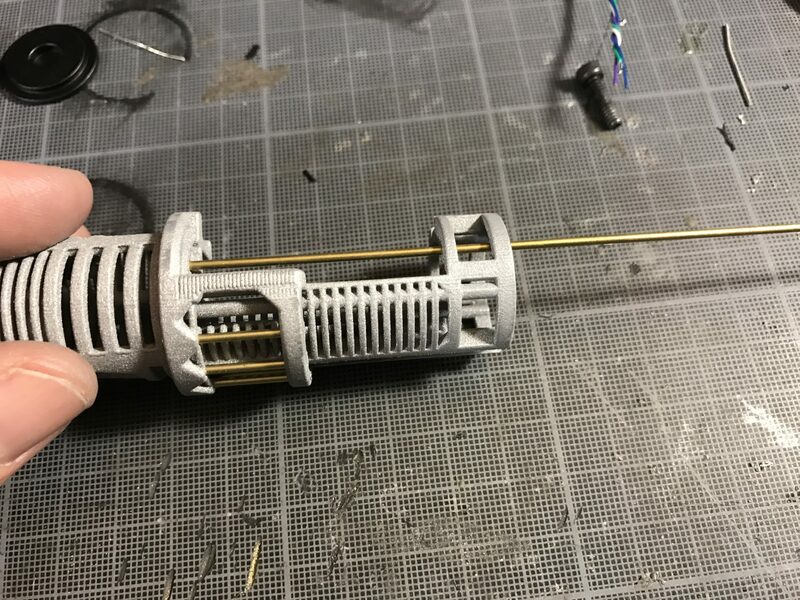 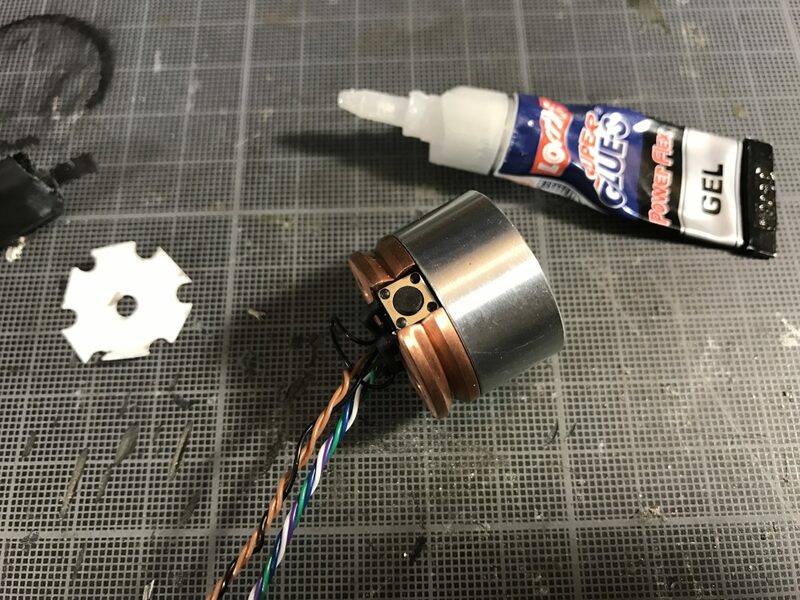 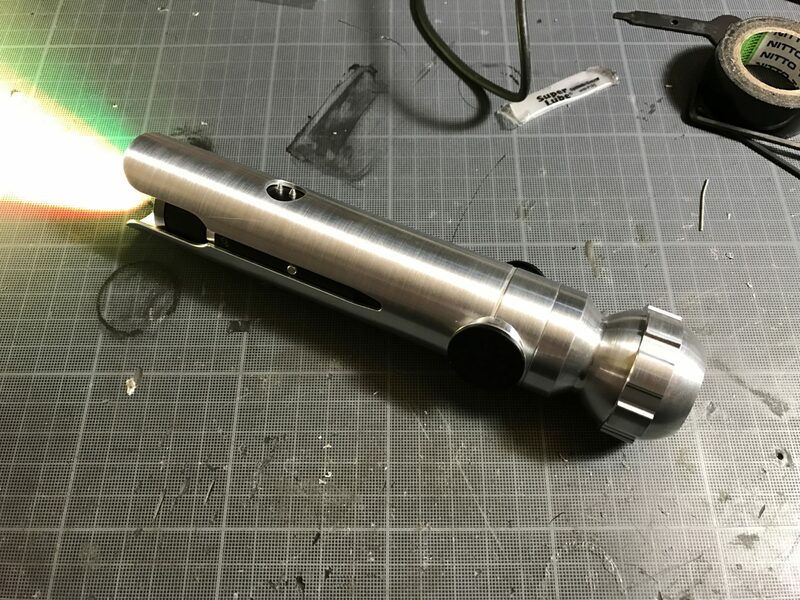 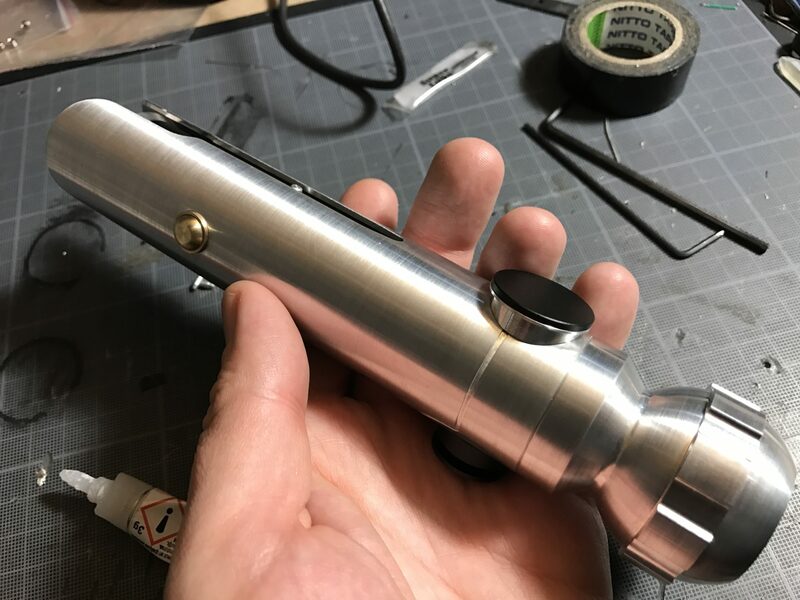 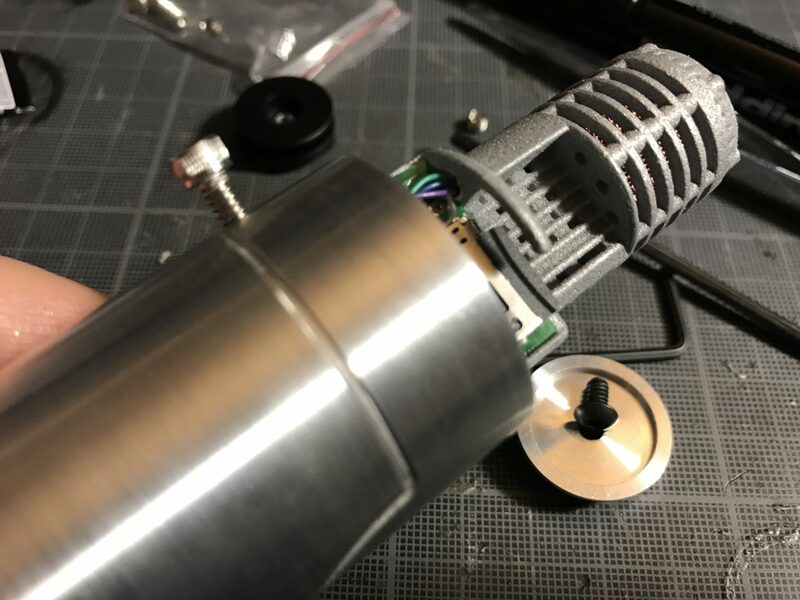 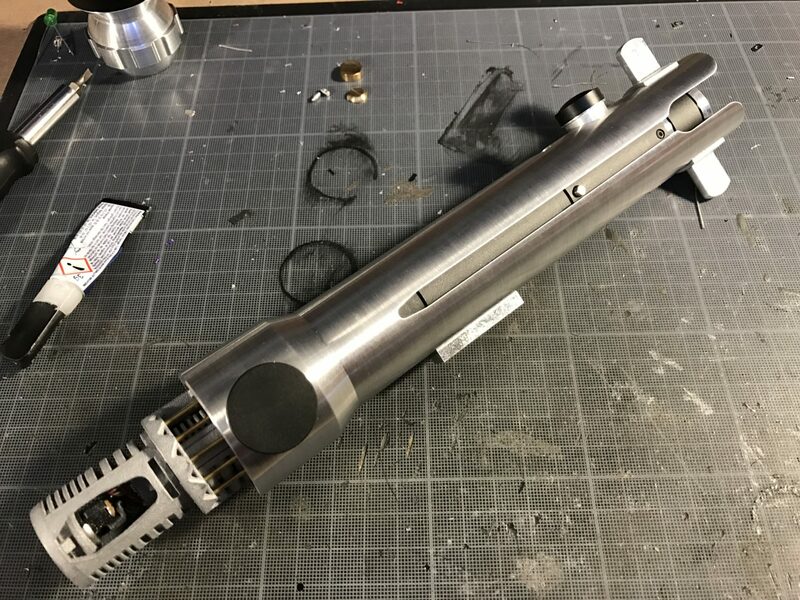 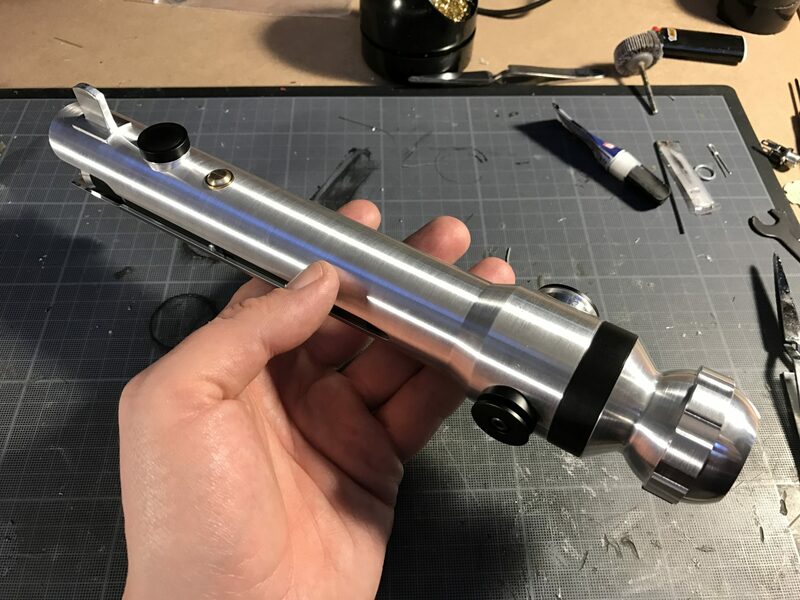 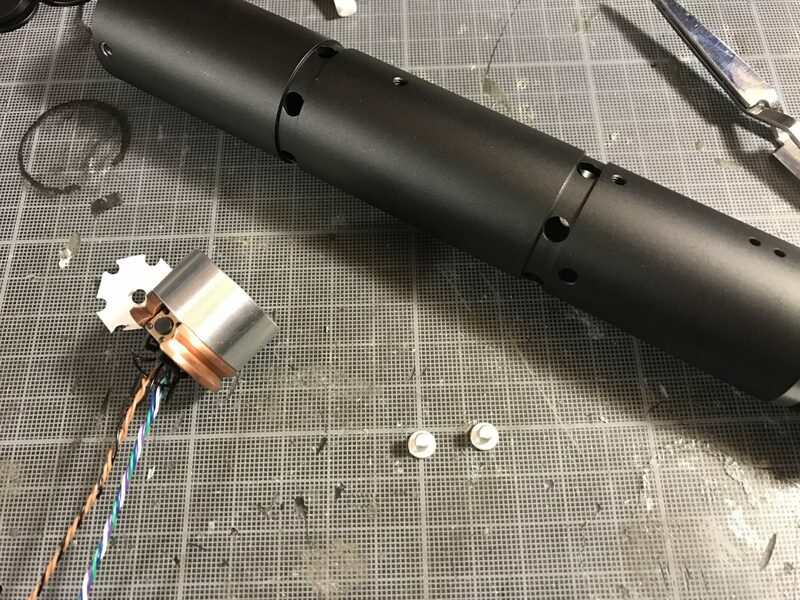 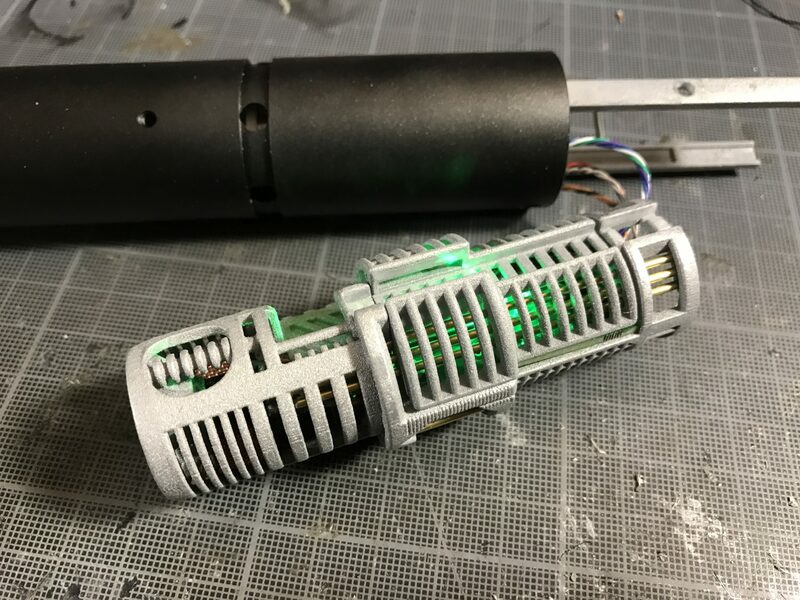 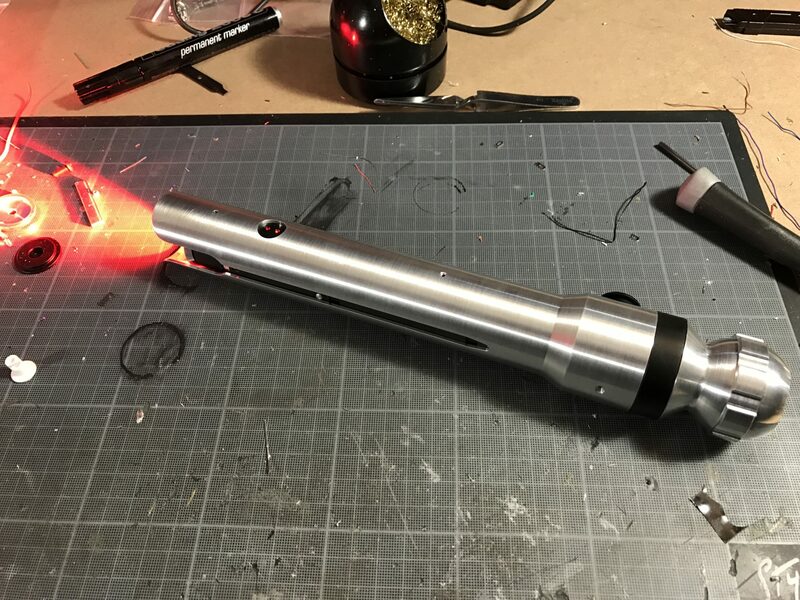 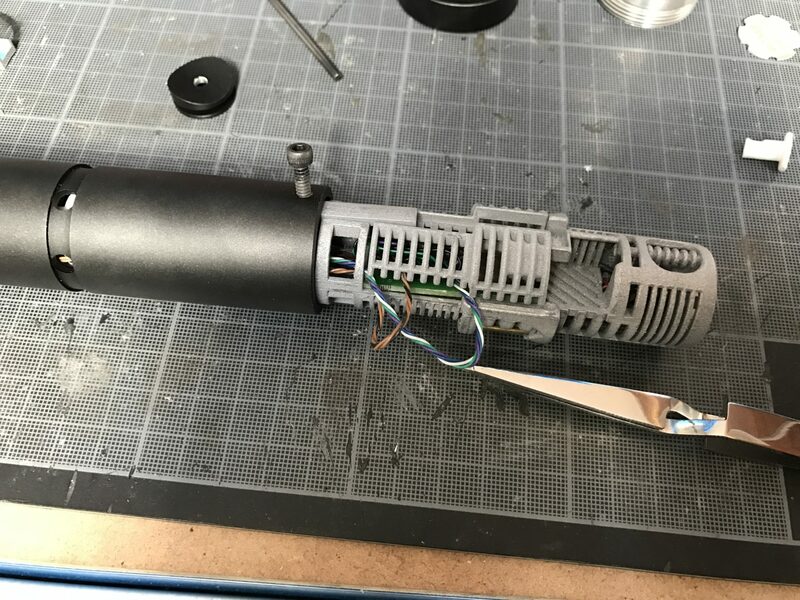 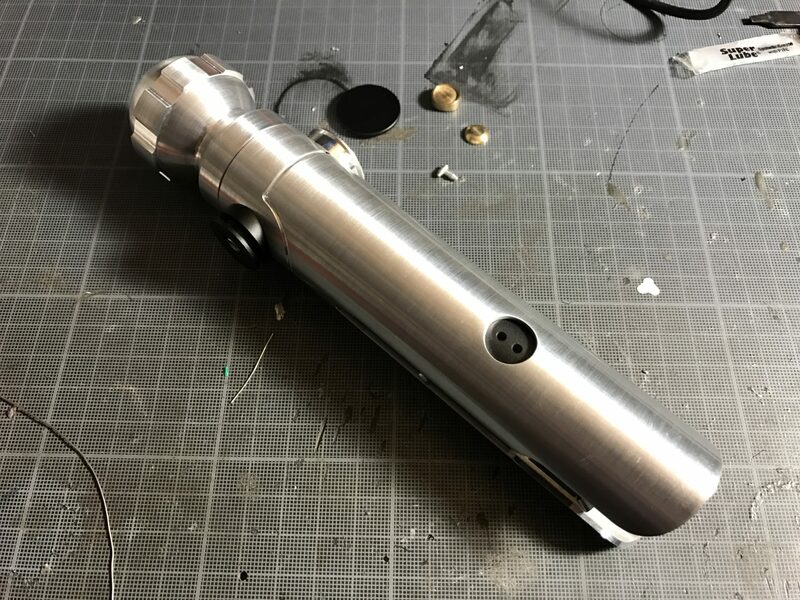 Note 3: The whole hilt is meant to be install friendly, however, intermediate skills will be needed to install the saber (cram-fu, precise soldering, …). 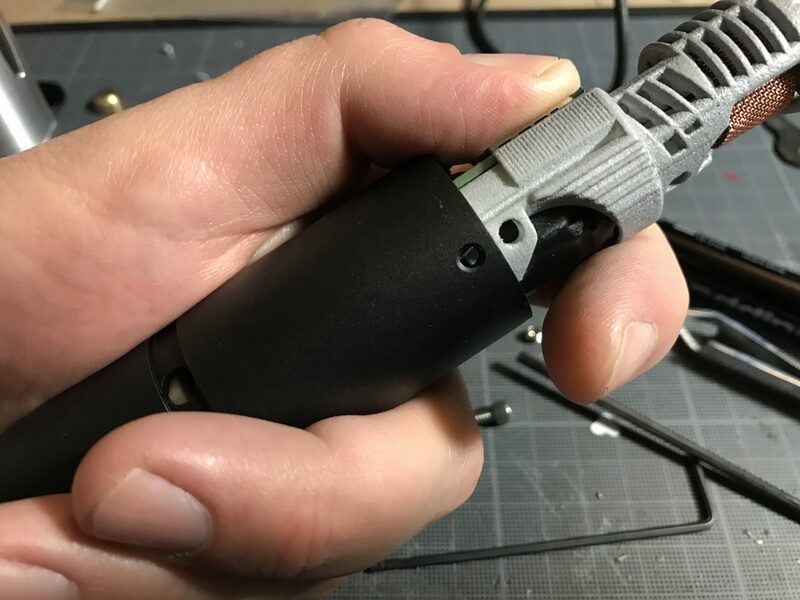 Read the full instructions before starting your install. 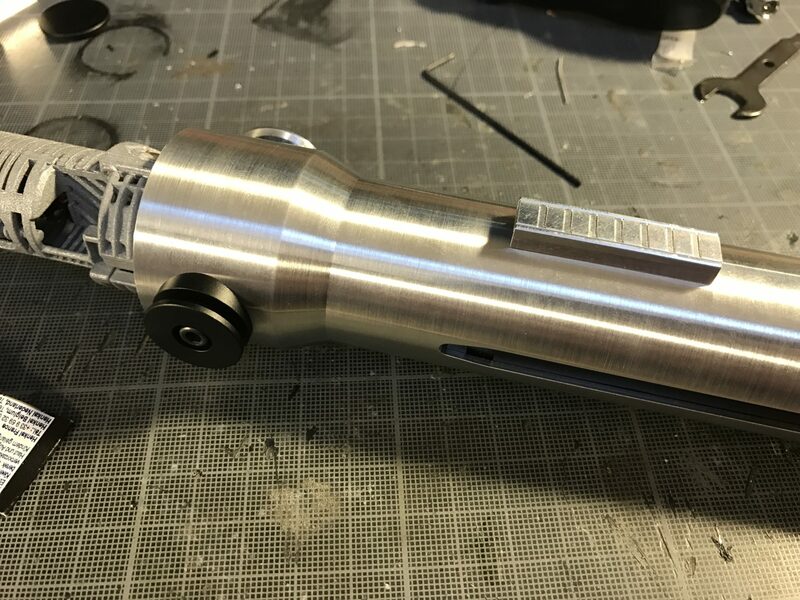 Commission an installer to build the hilt for you, if you feel unsure about what to do. 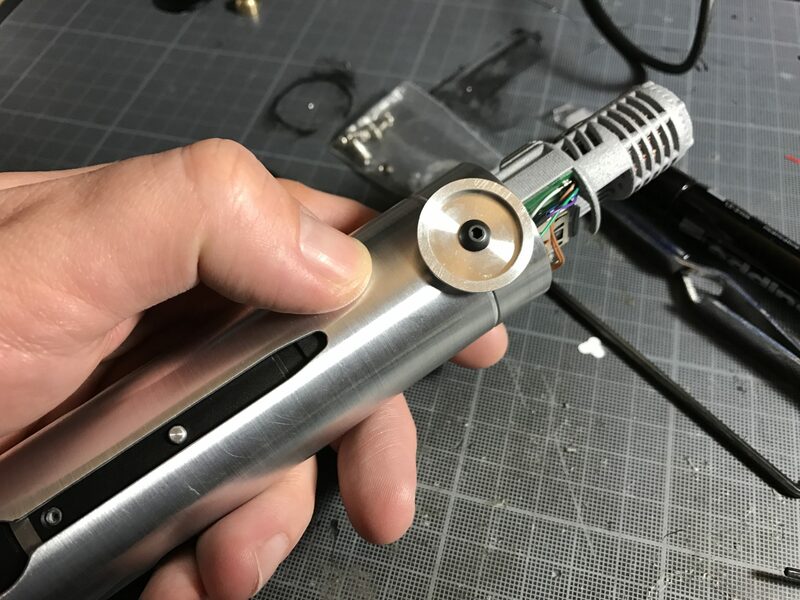 Note 4: About the Kill Key. 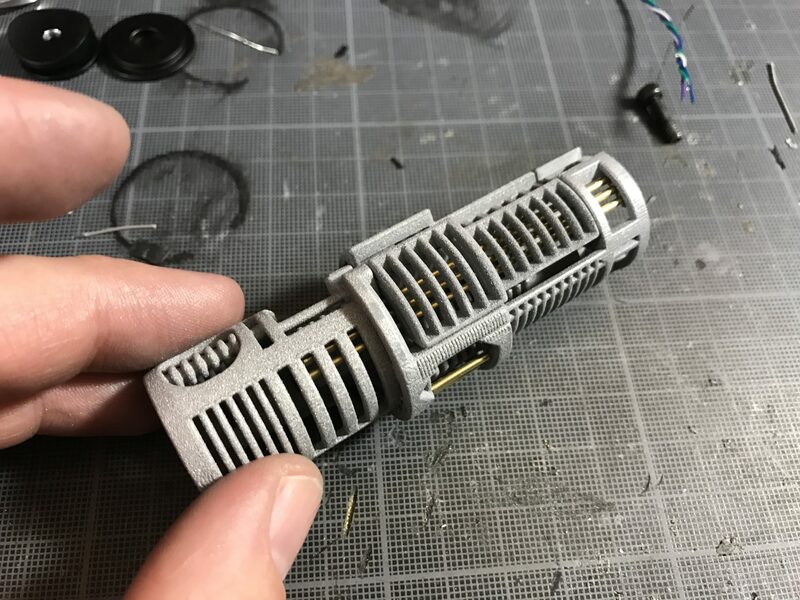 It is recommended to sand a bit the side of the kill key “on/off” slot, in order to make them more round and to turn better in the recharge port. 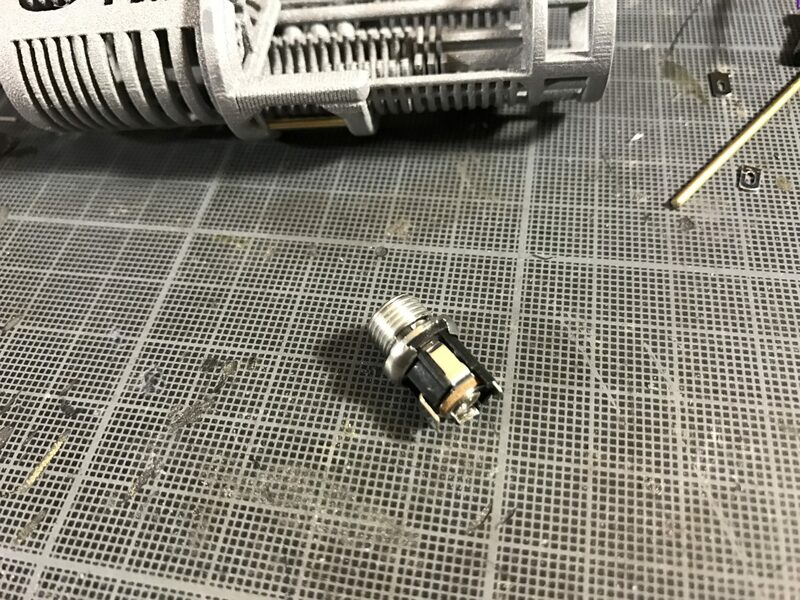 (as a reminder, this slot allow to start / stop the saber without removing the kill key). 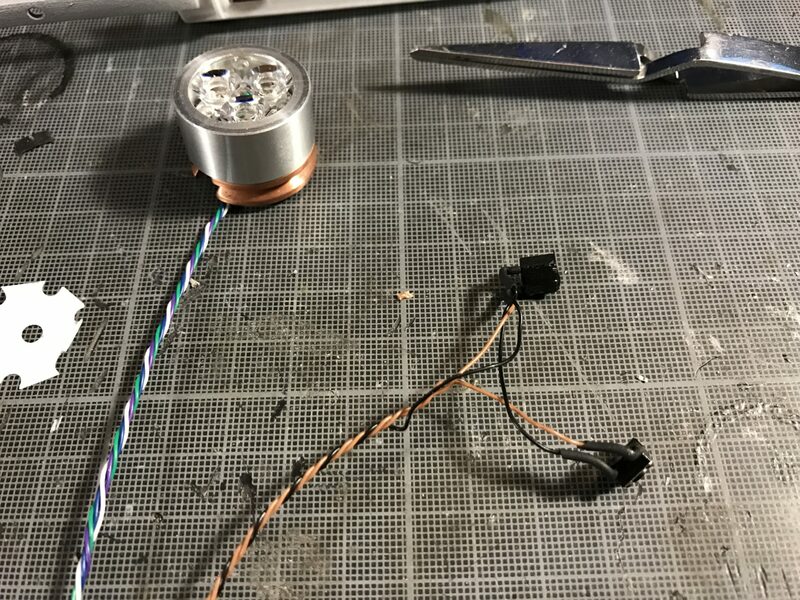 Step 2- Wire and install the switches provided into the led module. 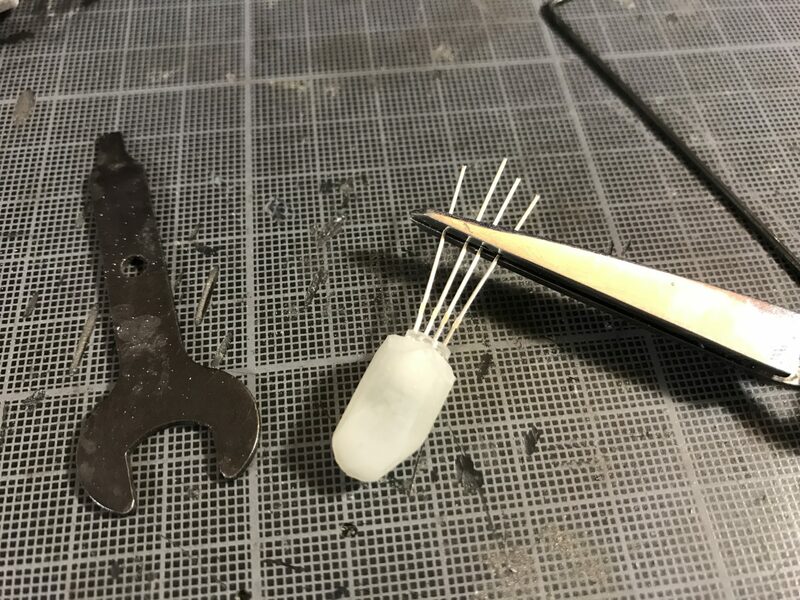 We first sand off one side of the leads, so that they won’t be shorts once installed in the heatsink (insulating the switches before installing them is also necessary). 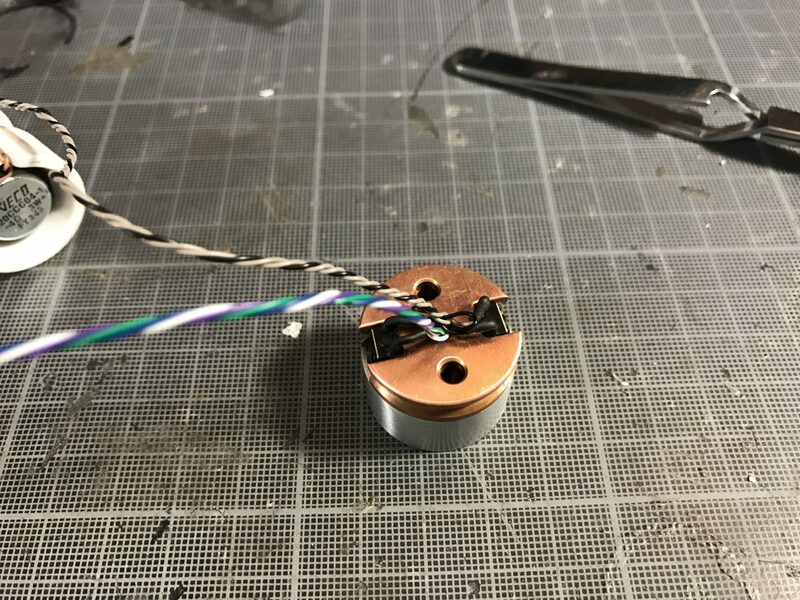 Notes: Make sure the wires take as less space as possible behind the heatsink. 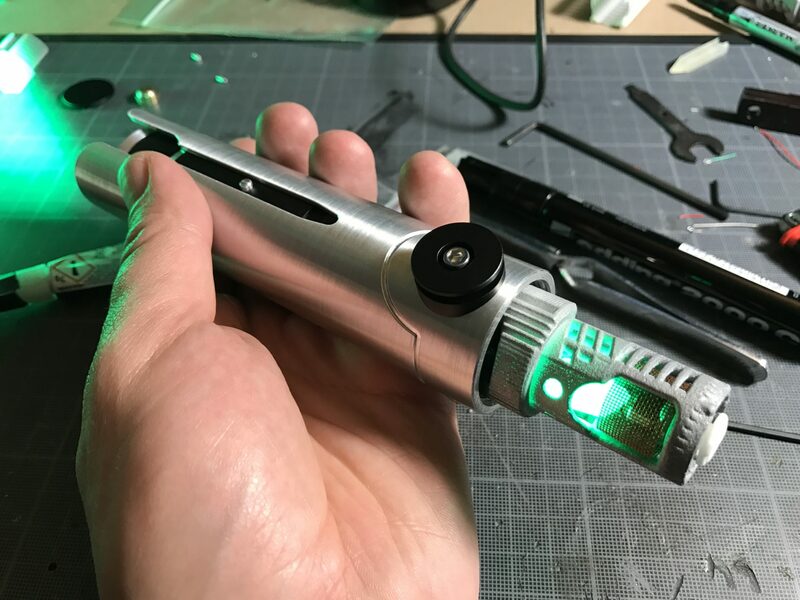 Step 3- Add the switch plungers to the hilt, then slide in the led module in. 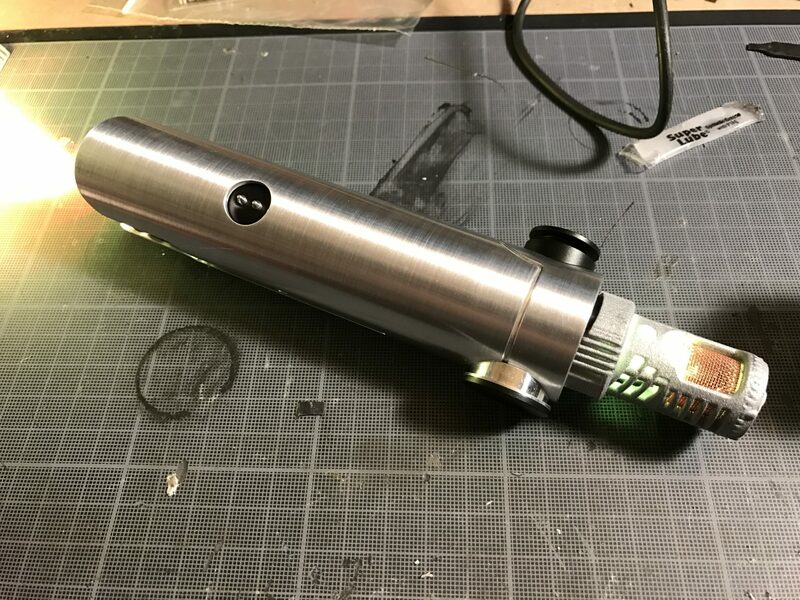 Once checked that the switch are well aligned with the plungers, lock the led module using the retention screw provided with the hilt. 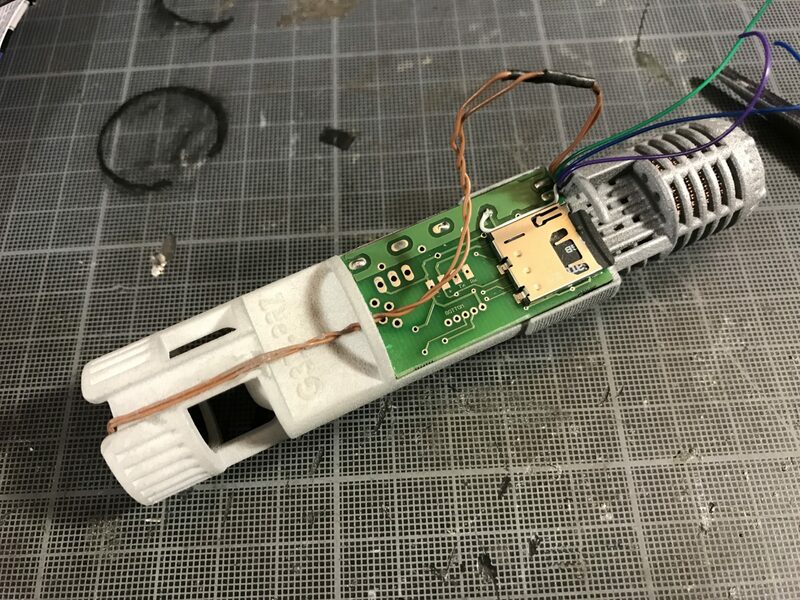 Make sure to test your switches before going further. 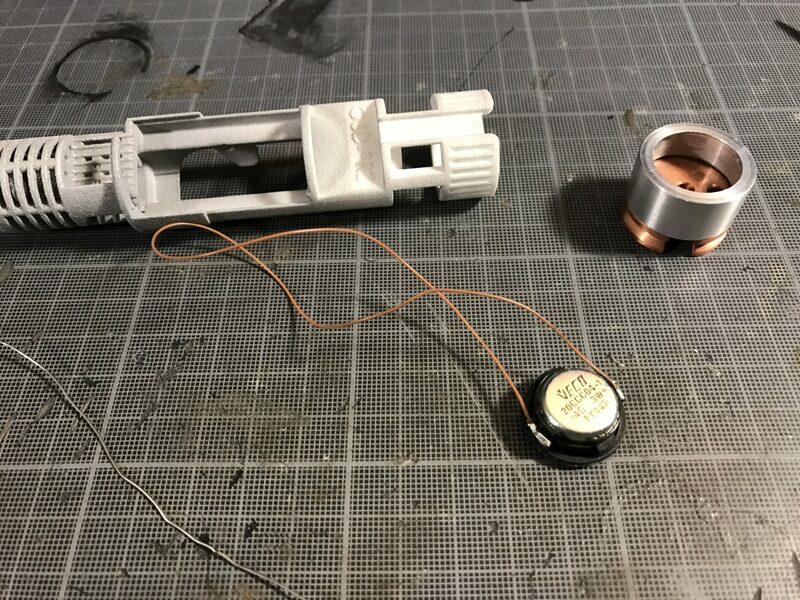 Step 4- Insert your battery into the dedicated chassis module. 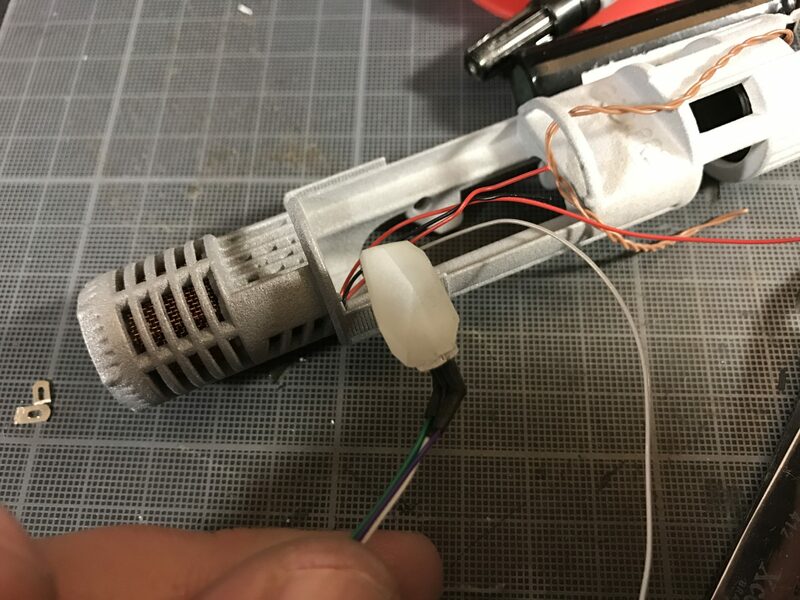 Step 5 – Wire and insert the speaker into the same chassis module as shown below. 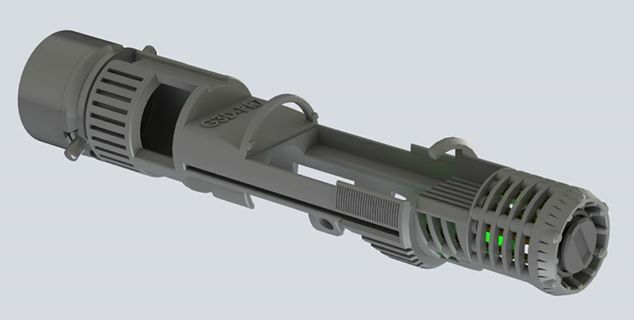 Step 6 – The module inserts into the black hilt as shown below. 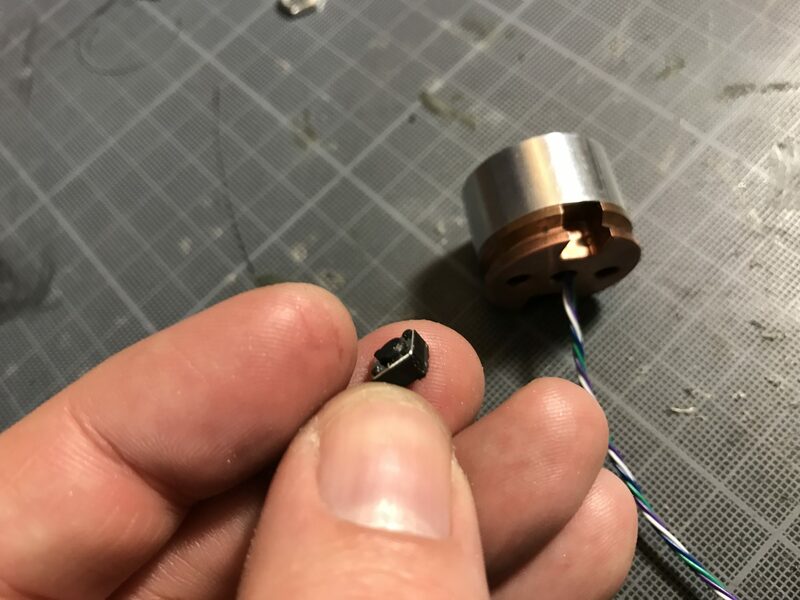 There is a hole that aligns withe the covertec screw hole. 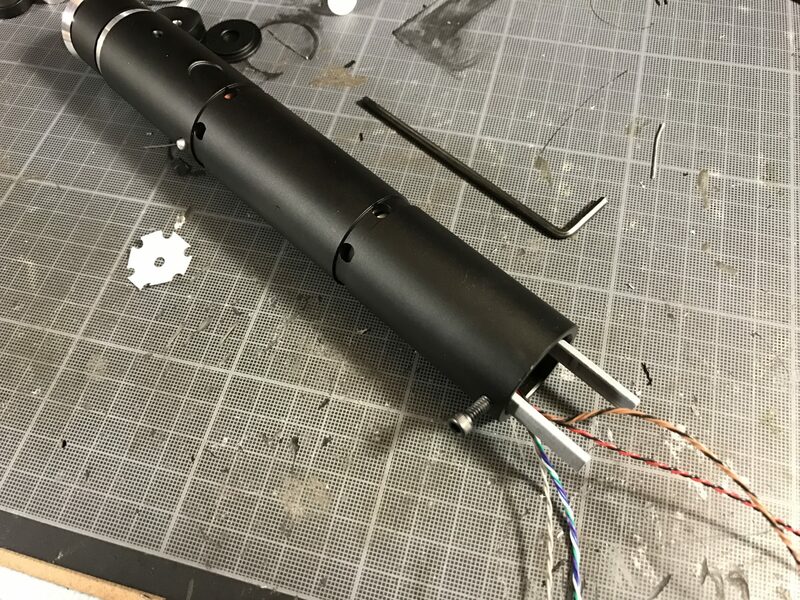 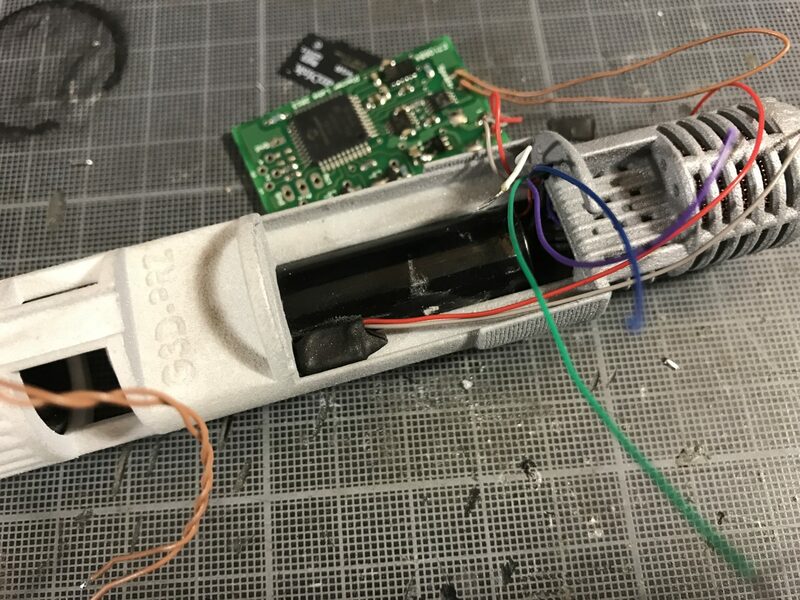 Open the chassis hole using a drill bit and Dremel to make sure the covertec screw locks in easily and secure the chassis from sliding down (then you can unlock that chassis module to proceed with the install). 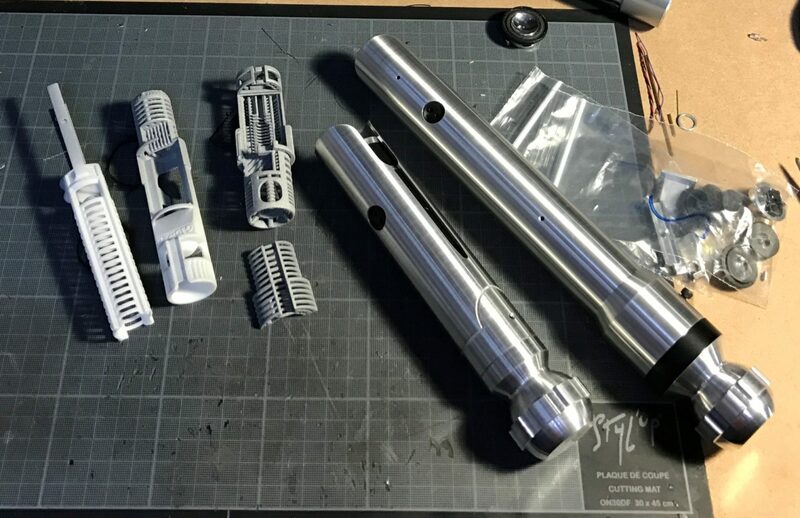 Step 7 – Cut and insert your 1.5mm OD rods. 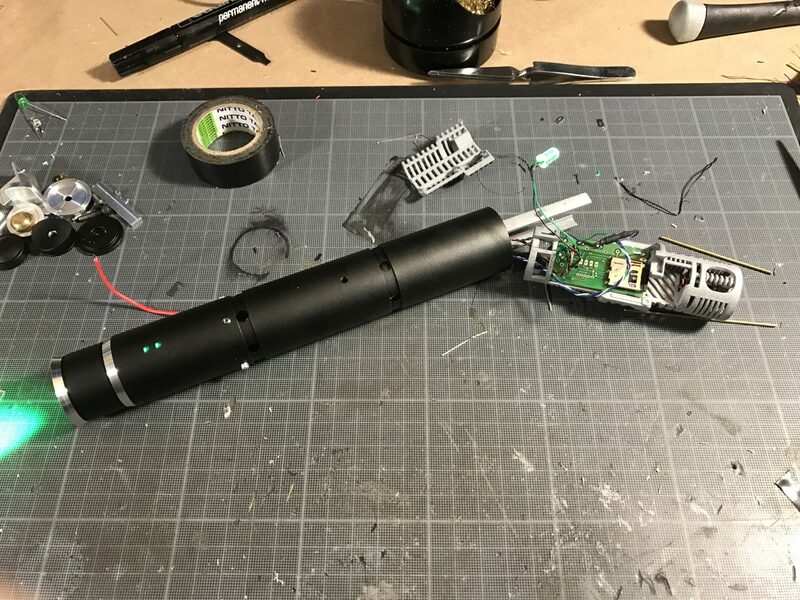 Test the soundboard cover accordingly. 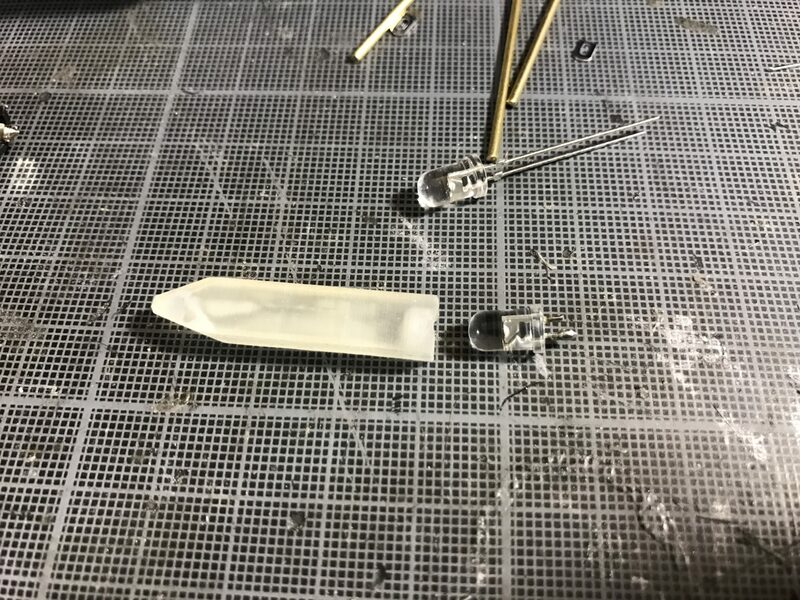 Step 8 – You can install an optional crystal at this point. 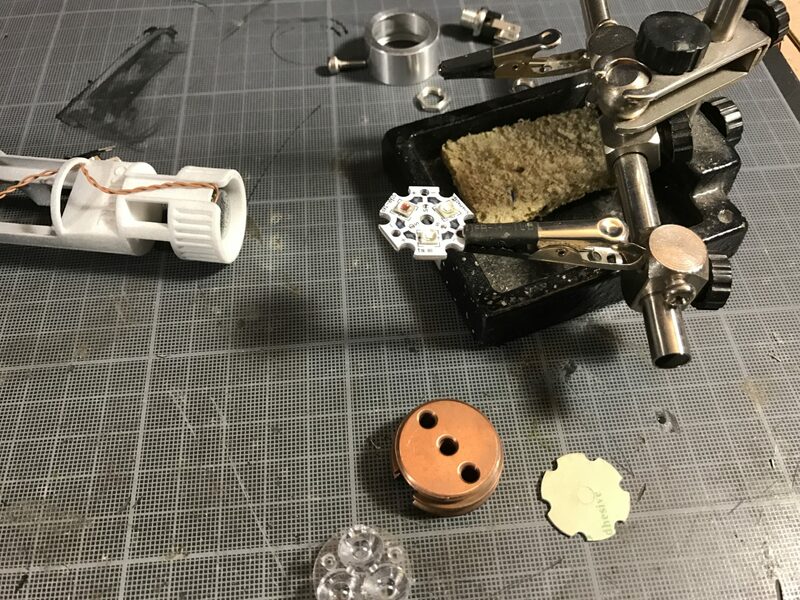 Step 9 – Partially assemble the 2 chassis module, passing the wires as shown (Speaker and battery wires below the board, Led, crystal and switches wires above the board). 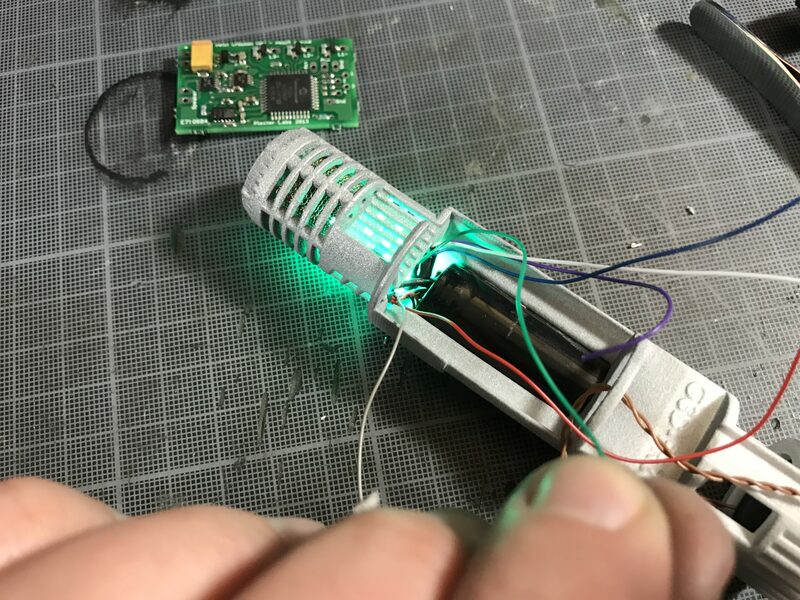 Step 10 – (Prizm or CF related) solder the speaker and power wires, then add the Soundboard to the chassis. 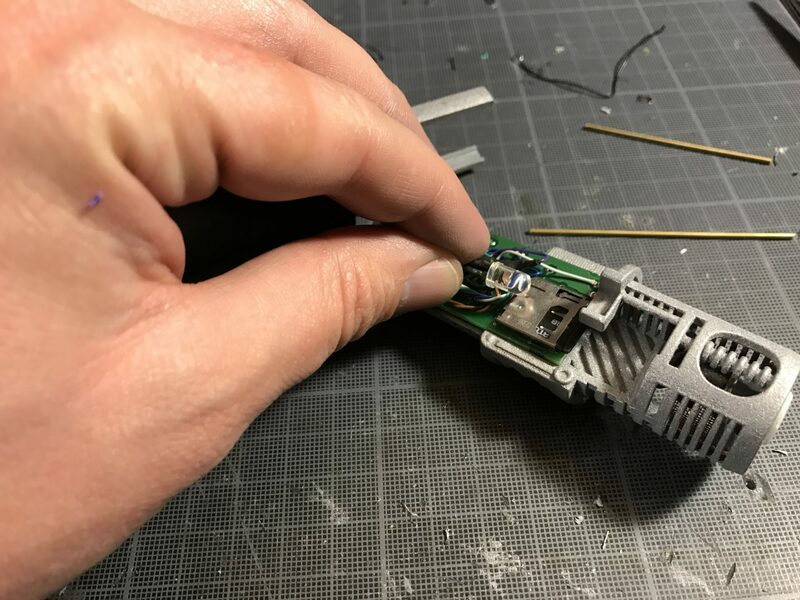 Step 11 – Wire and install the recharge port into the back of the soundboard module. 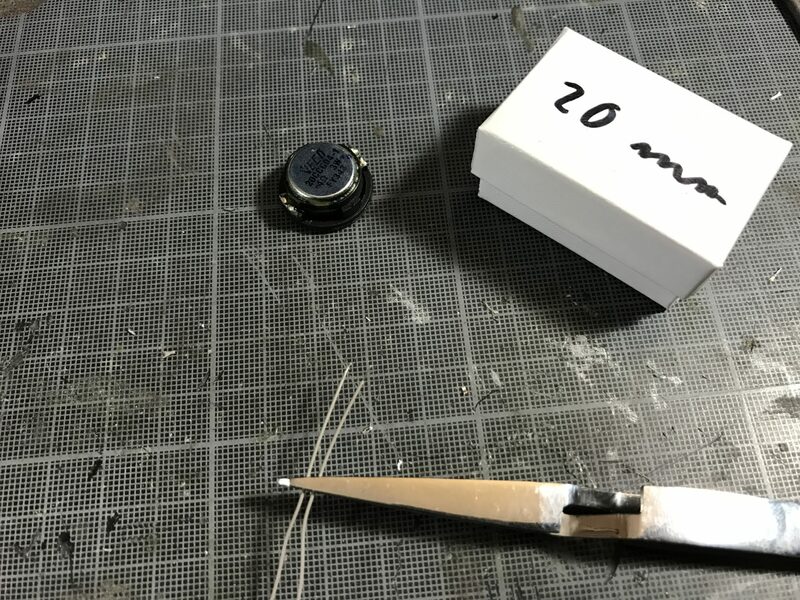 First cut the port leads to the minimum needed. 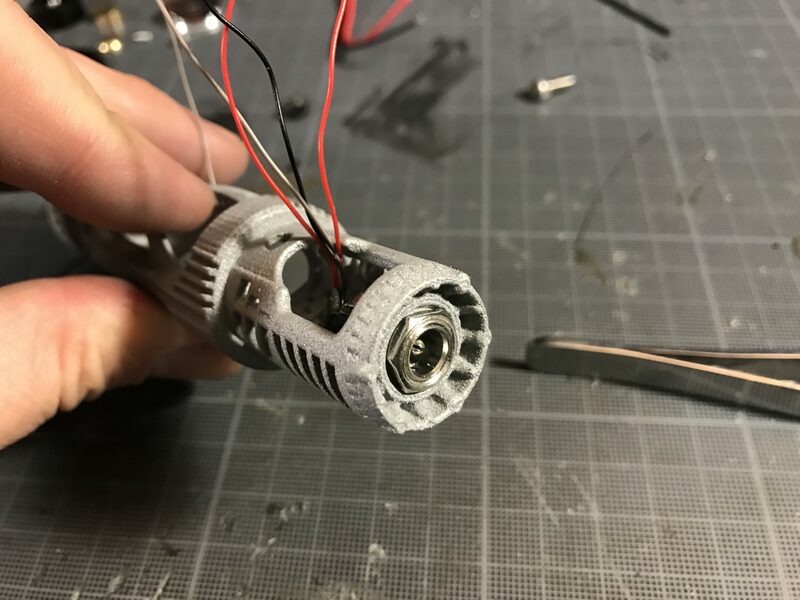 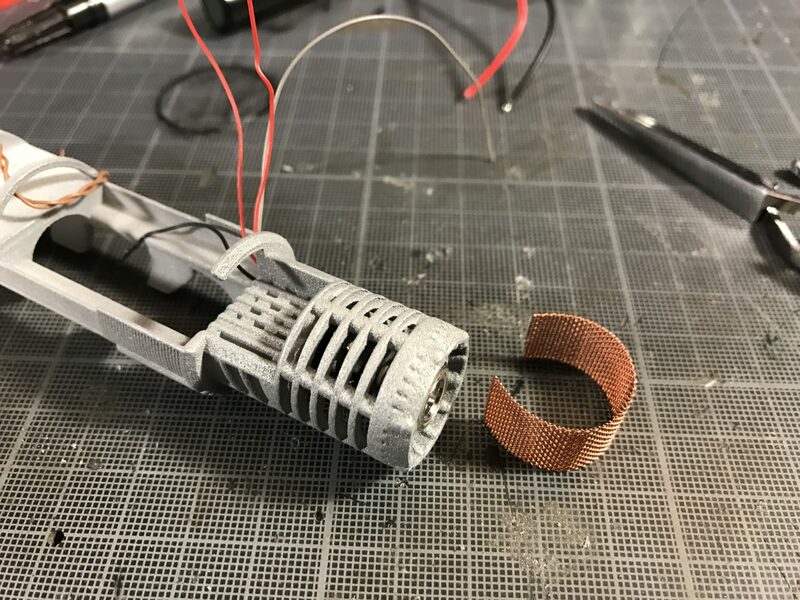 Depending on the recharge port, expanding a bit the dedicated hole on the chassis will be required for it to slide through easily and be secured with the associated hex nut (a drill bit and a Dremel can be used for that). 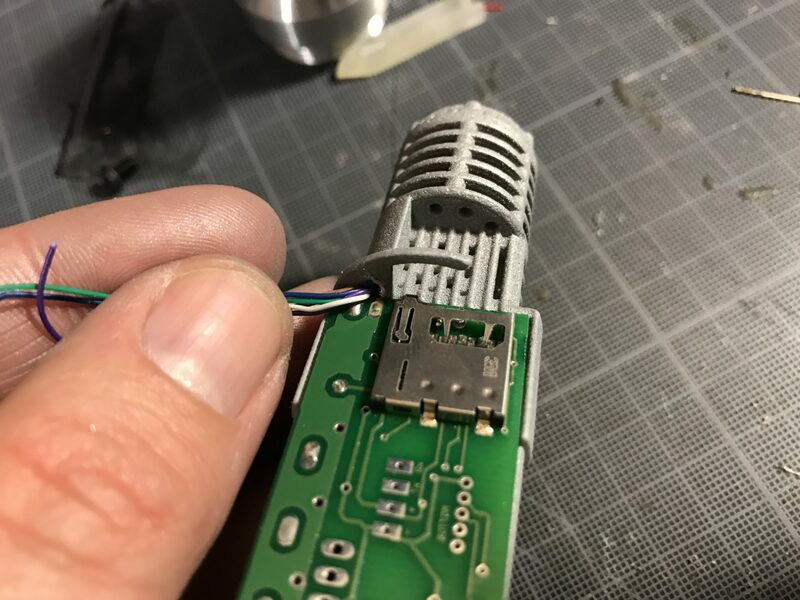 Step 12 – Finish wiring the soundboard. 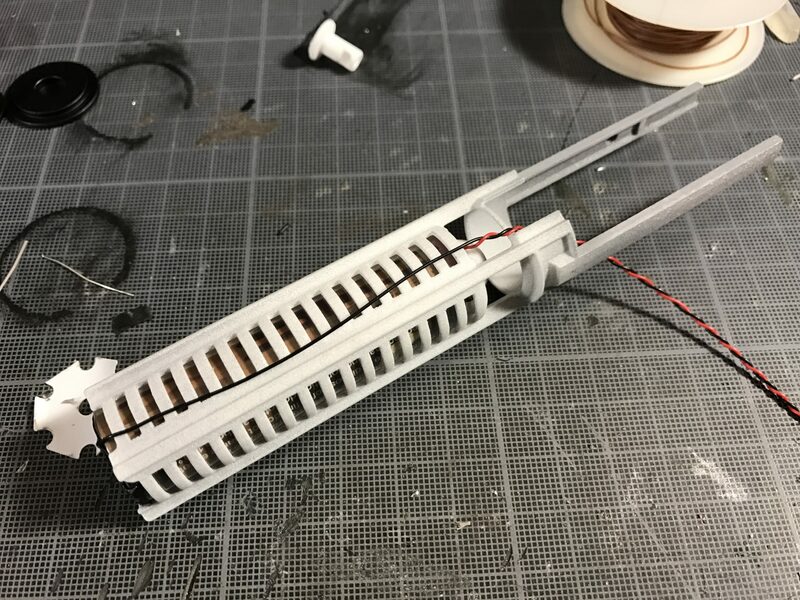 Step 13 – Finish wiring the soundboard. 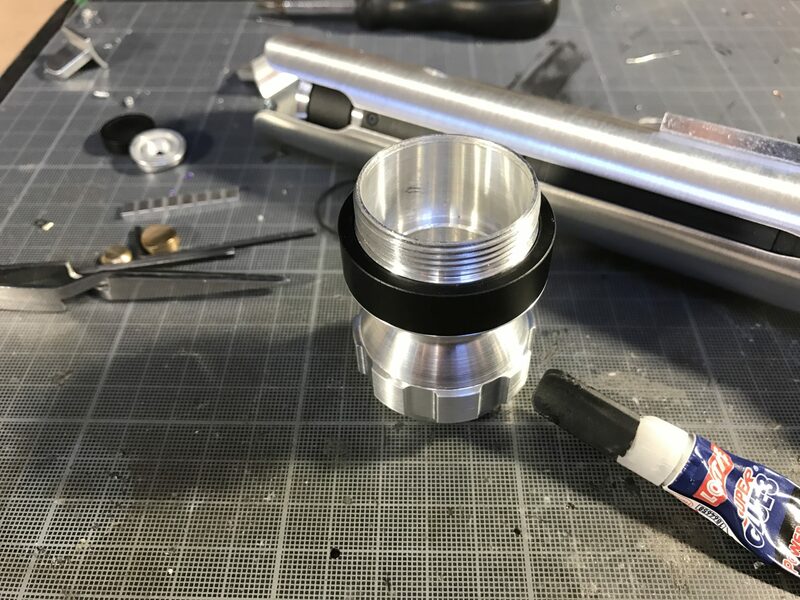 Step 14 – Add the cover and secure it with the 3 rods. 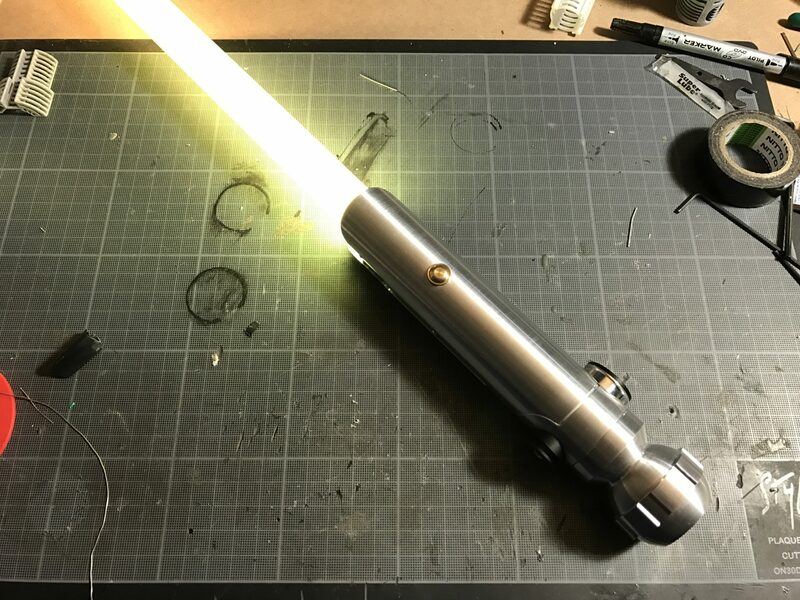 And test again. 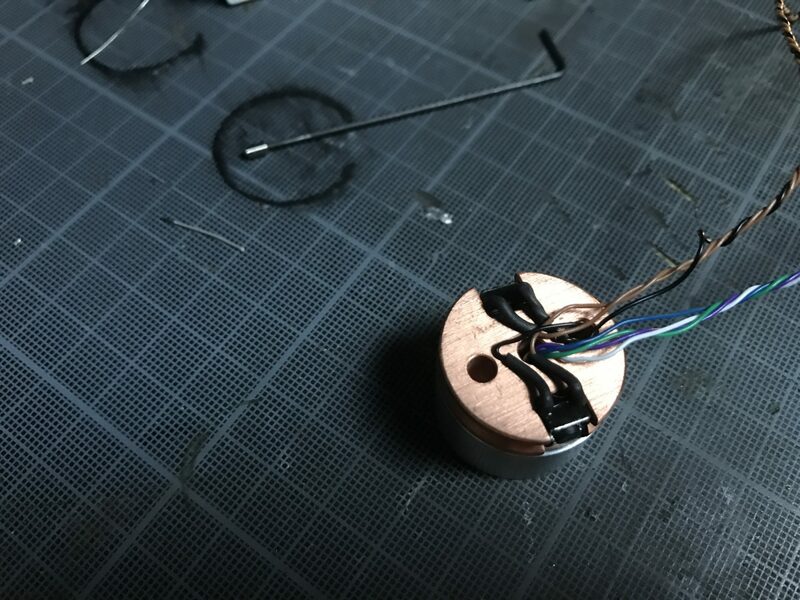 Notes: If you wish to use a RICE port, you can install a Micro JST female plug (3 wires) in the board cover. 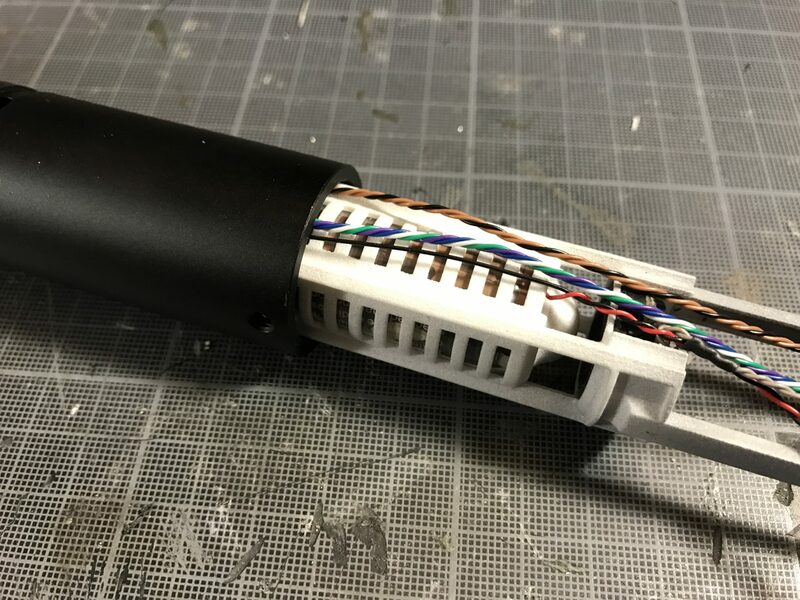 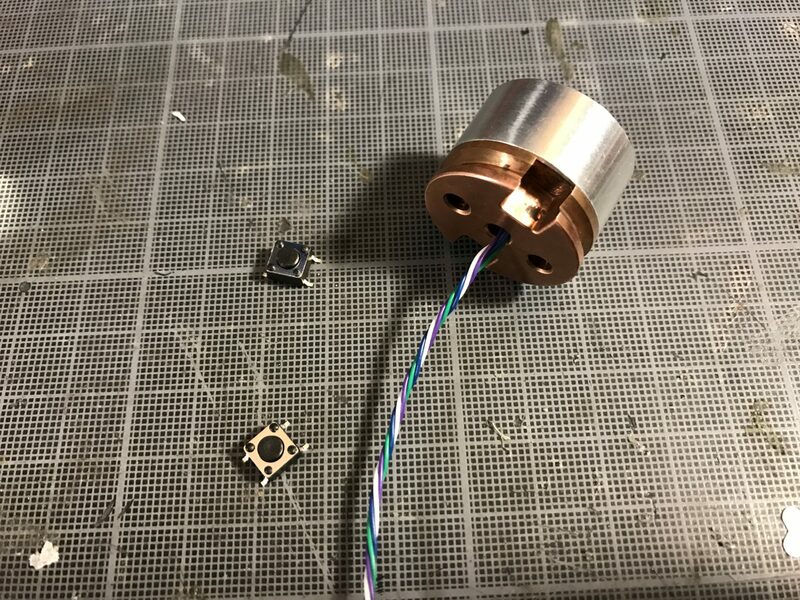 You will then have to create an adapter for your RICE cable (either female jack / male Micro JST, or cut the RICE cable to add a micro JST connection). 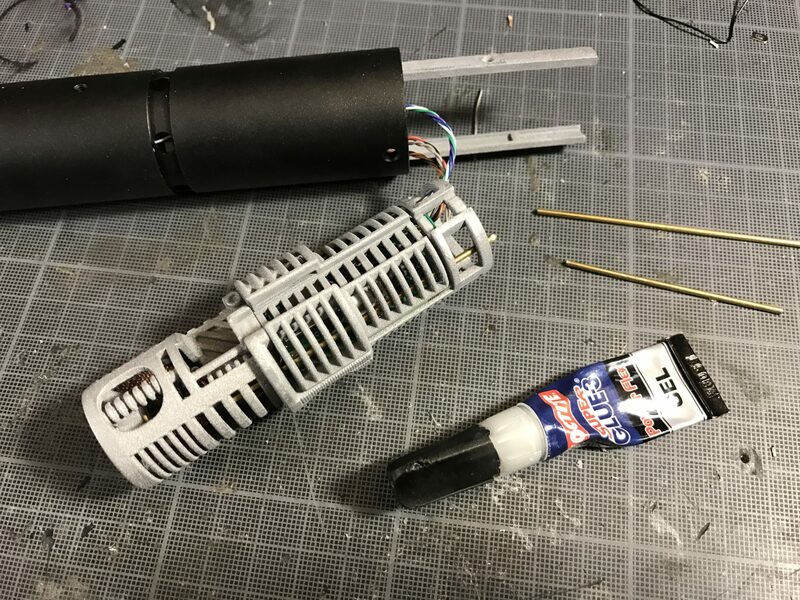 Step 15 – Assemble the soundboard module back. 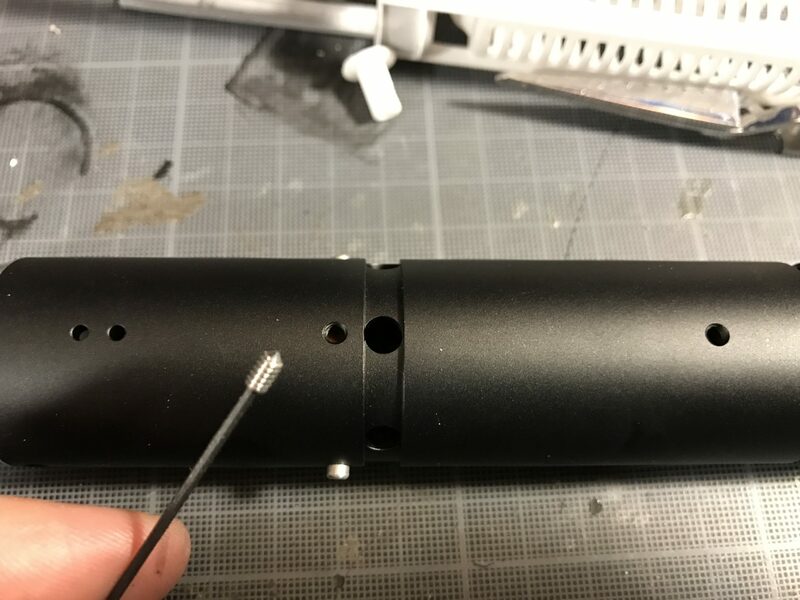 Important: Before assembling the black to into the shroud and lock everything using the coverted screw, understand that the slide in/out feature of the chassis is optional. 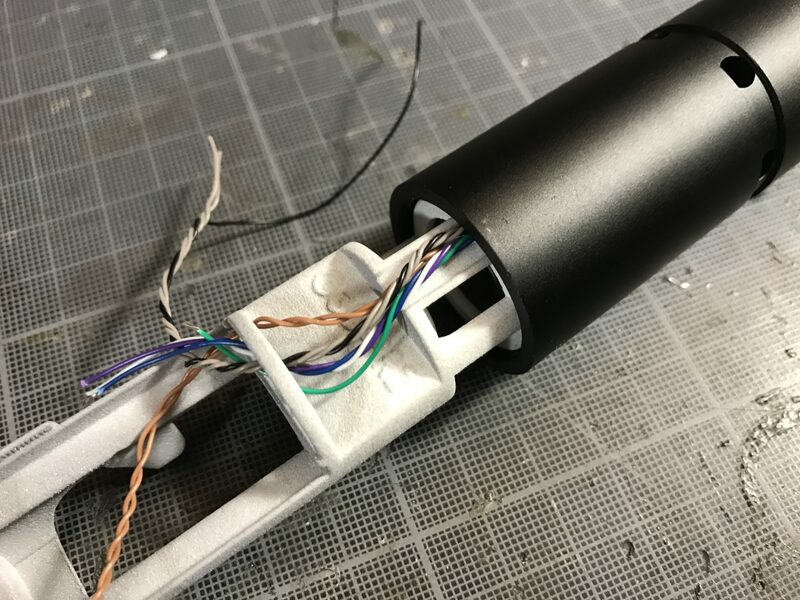 The chassis is designed that way to ease the installation and leave as less wires as possible in front of the battery module (to line up the speaker with the sound holes). 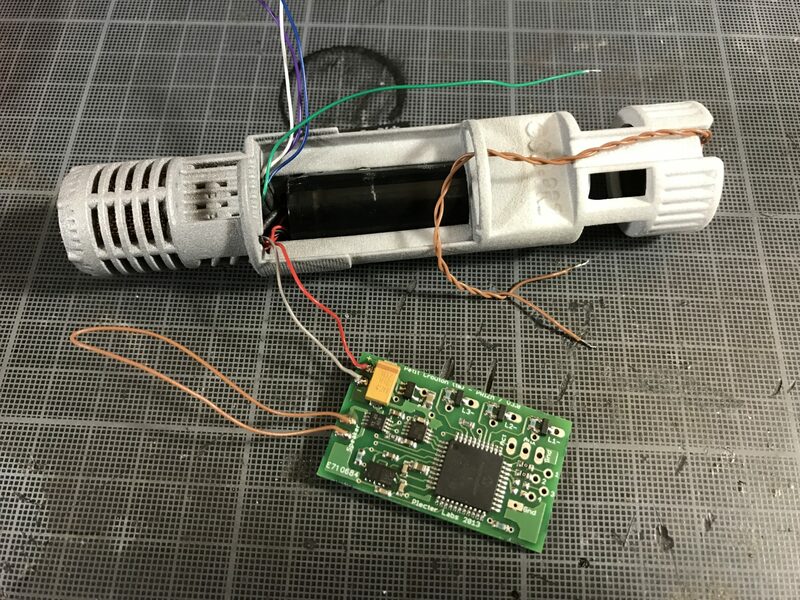 If you don’t need the sliding feature, glue both module together and lock the assembly with the Covertec screw. 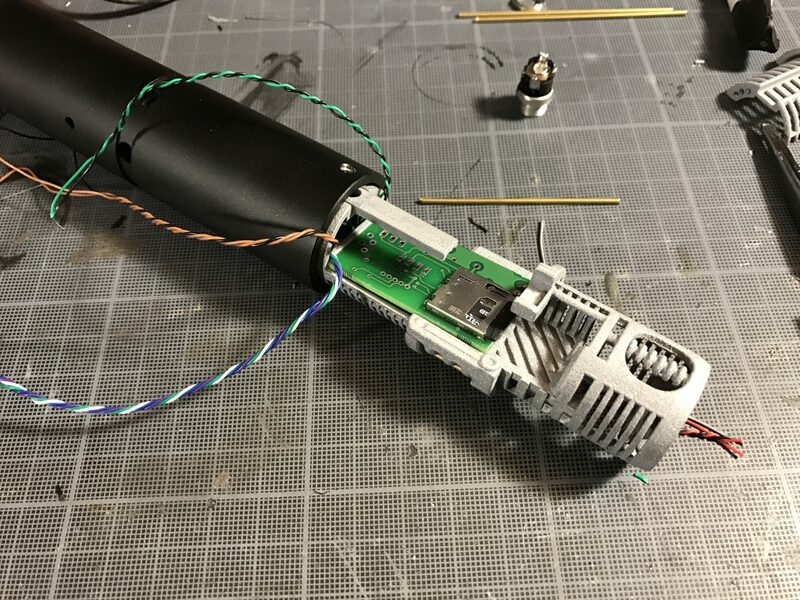 If you want to use the sliding feature, make sure there is enough wire length between both modules and that the wires are centered properly not to prevent the chassis to slide back entirely. 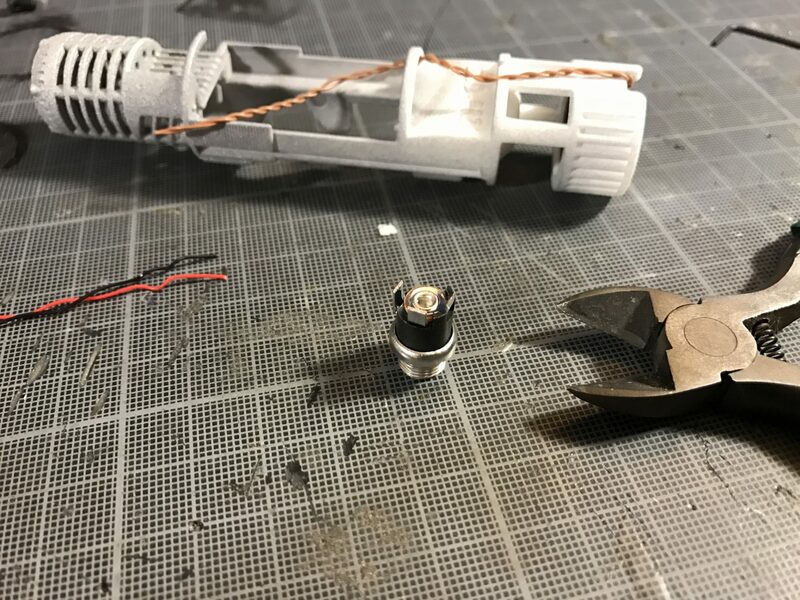 Step 16 – Make sure to test everything properly before going further. 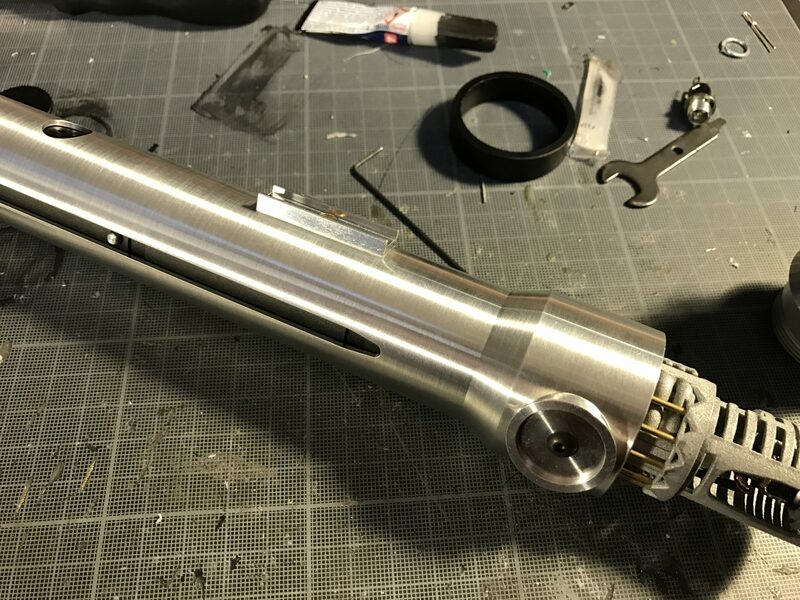 Step 17 – Add the cosmetic elements to the hilt. 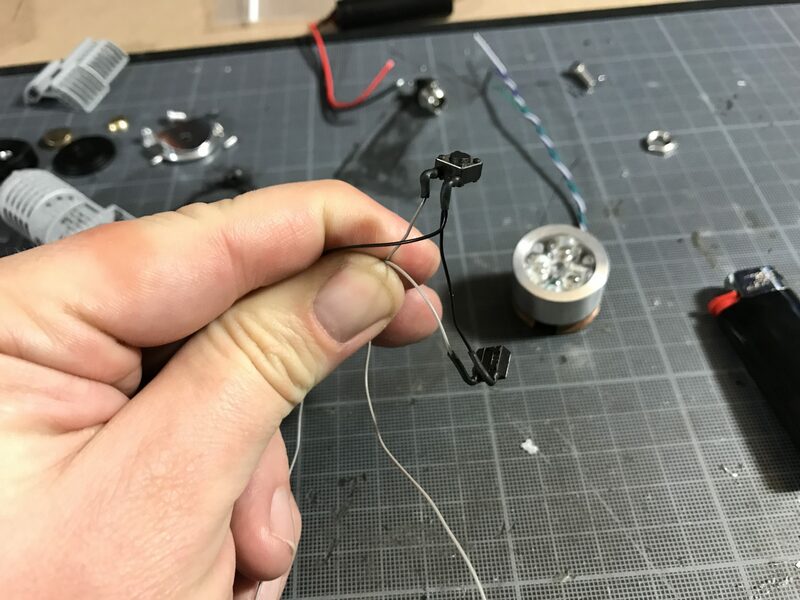 Step 1- Wire and install your speaker into the dedicated area in the chassis as shown below. 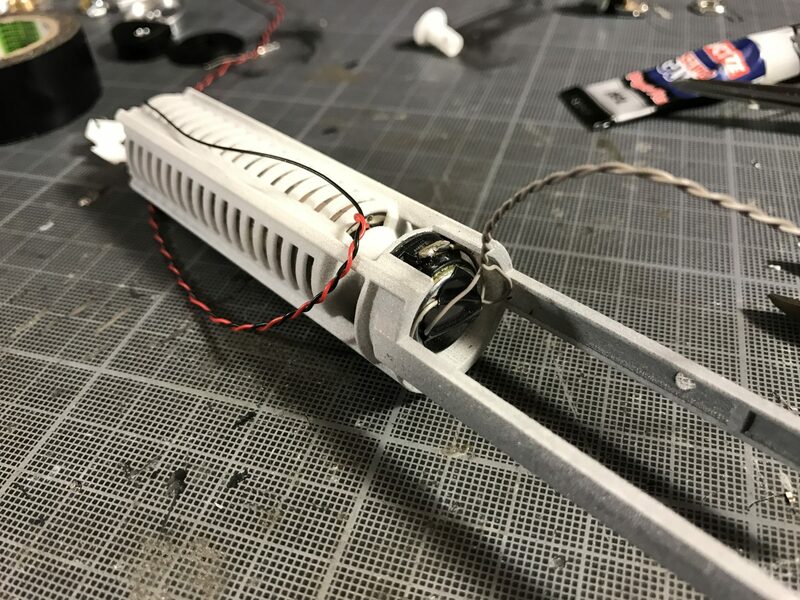 Step 2- Wire and install your main led into the 1″ led module provided with the hilt. 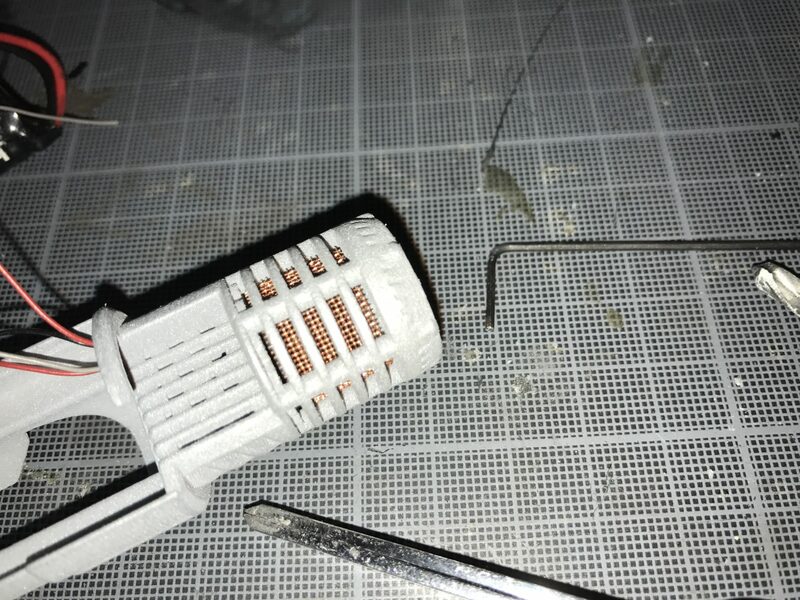 Step 3- Wire and install the switches provided into the led module. 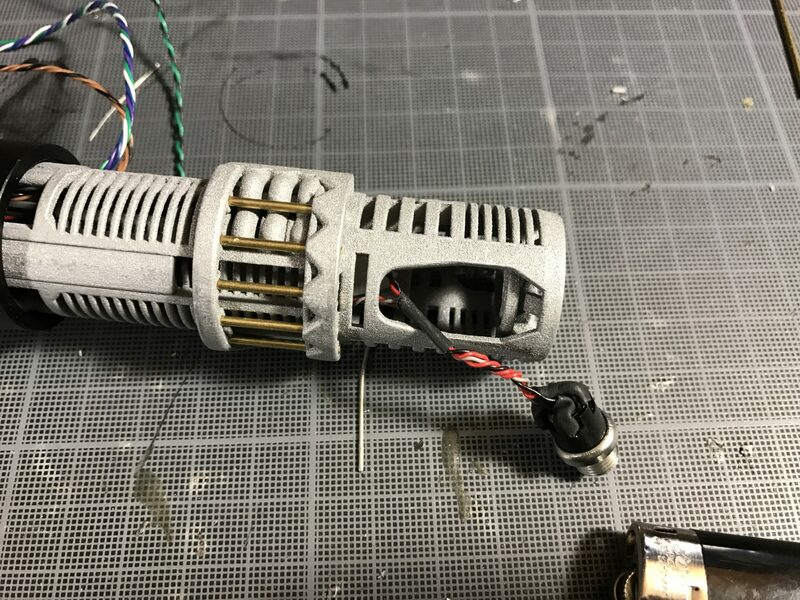 We first sand off one side of the leads, so that they won’t be shorts once installed in the heatsink (insulating the switches before installing them is also necessary). 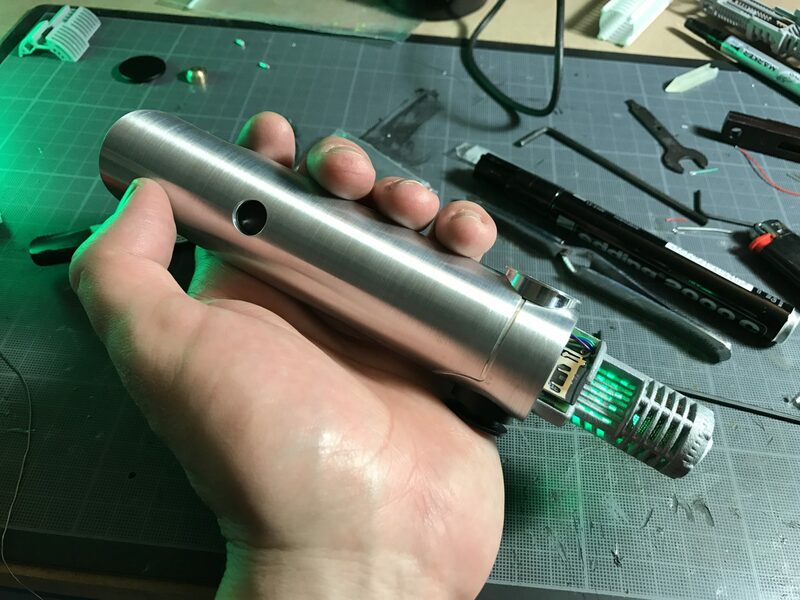 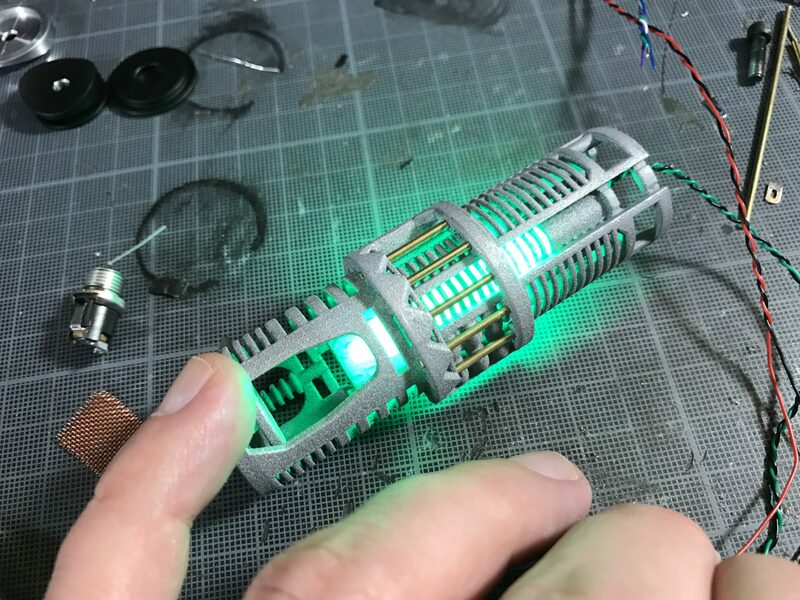 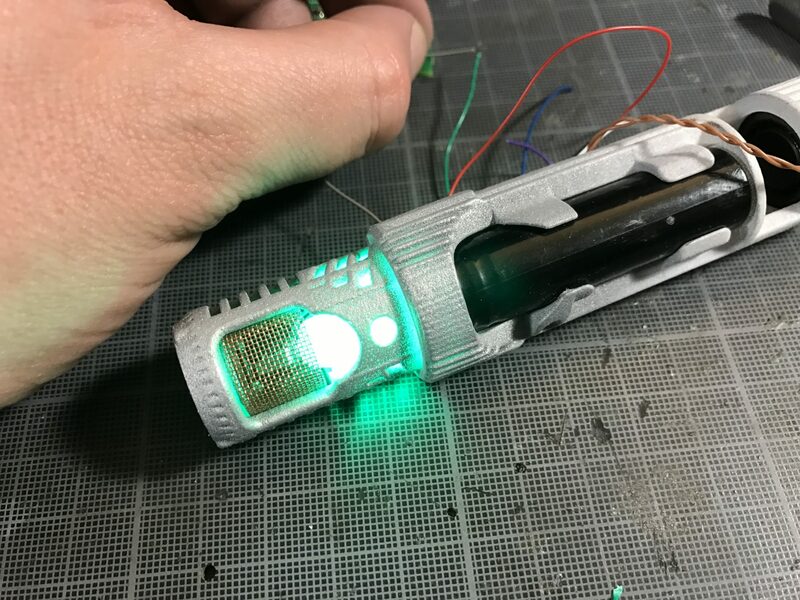 Step 4- Add the switch plungers to the hilt, then slide in the led module in. 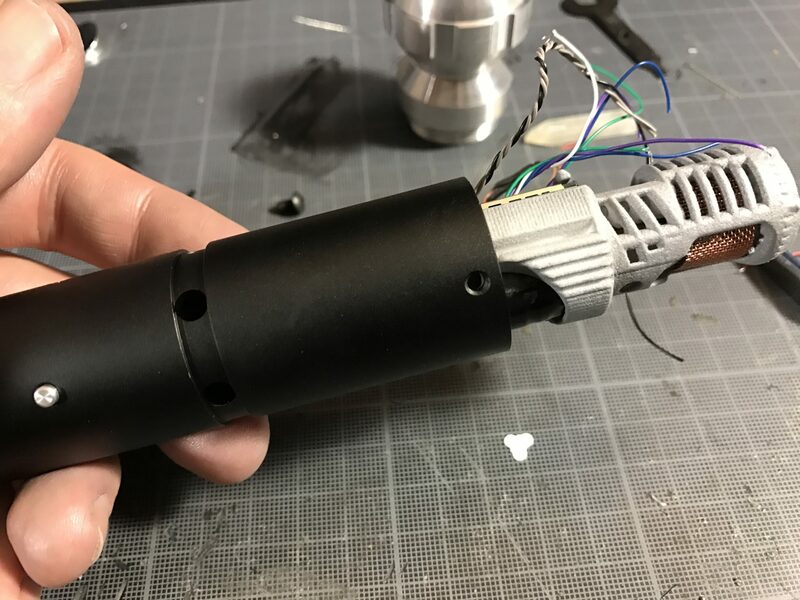 Once checked that the switch are well aligned with the plungers, lock the led module using the retention screw provided with the hilt. 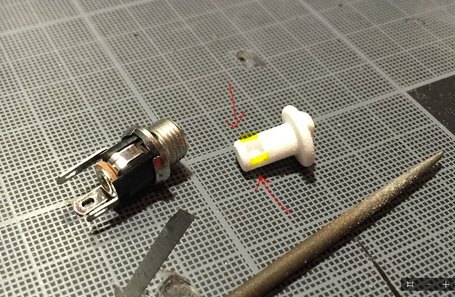 Make sure to test your switches before going further. 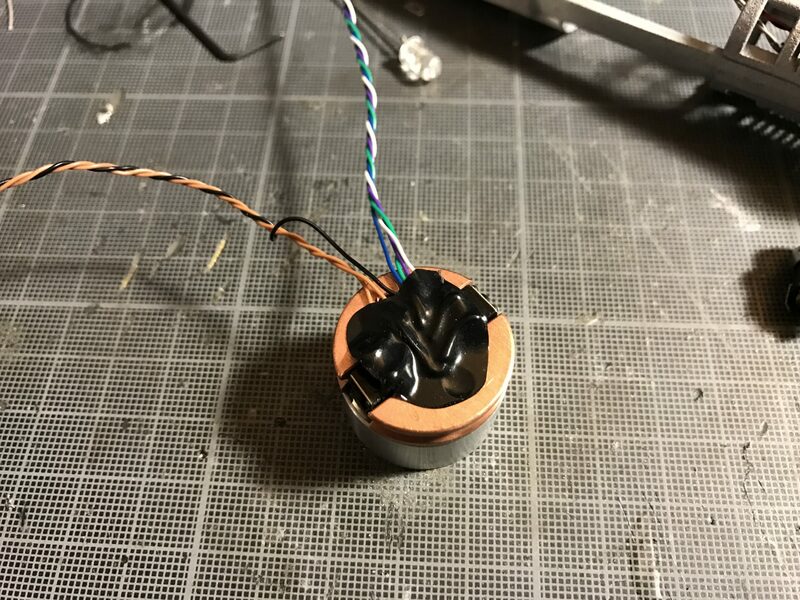 Step 5- Wire and install the recharge port (you’ll need to cut the lead to the minimum first). 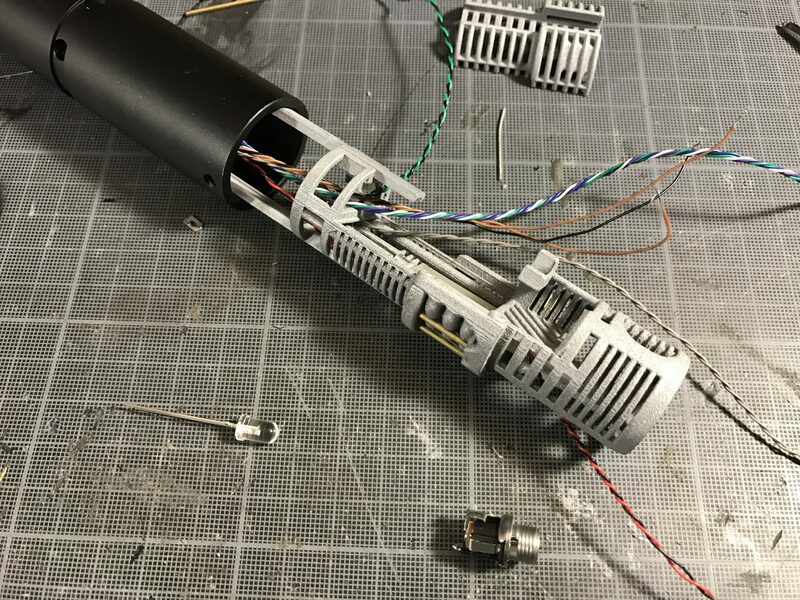 Notes: the chassis have wire channels as shown below. 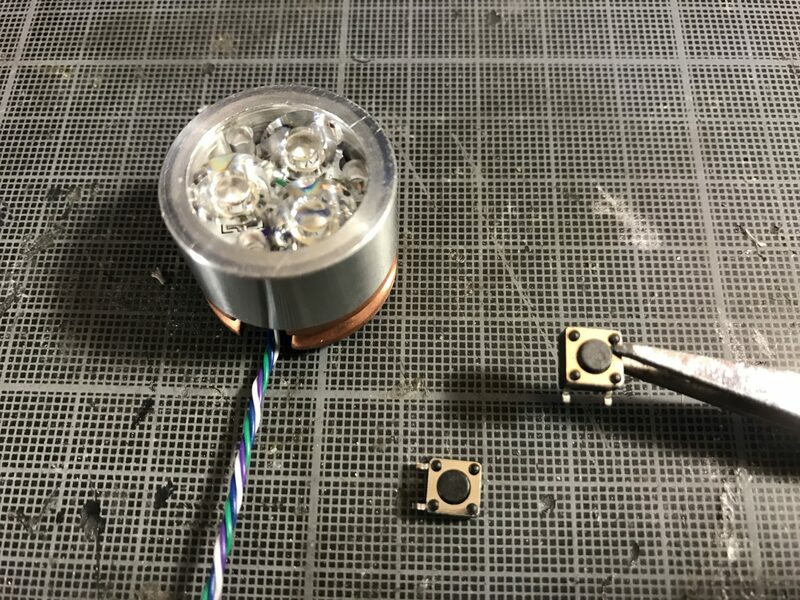 We recommend to make the channel hole on the first pictures bigger if you plan to use a RGB accent led (use a drill bit and a Dremel to do so). 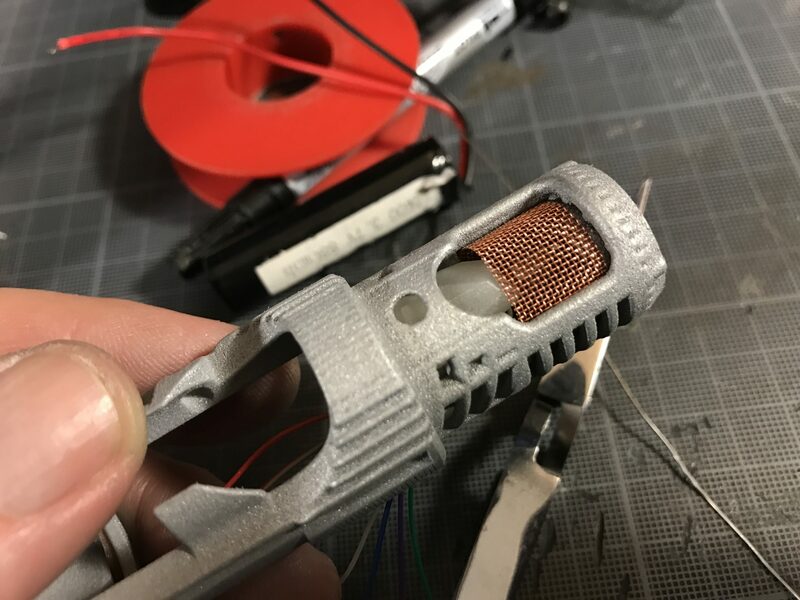 Notes: You can “hide” the recharge port using wire mesh or else. 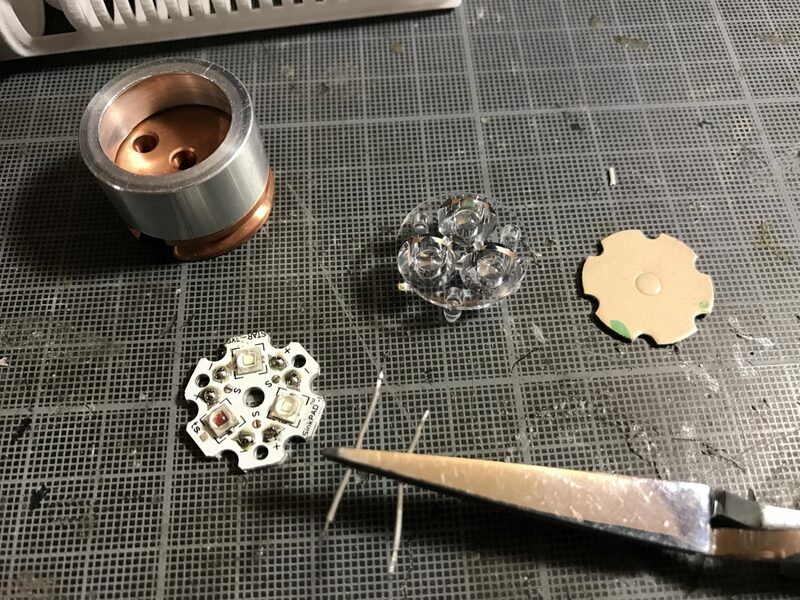 Step 6- Wire the “crystal” accent led. 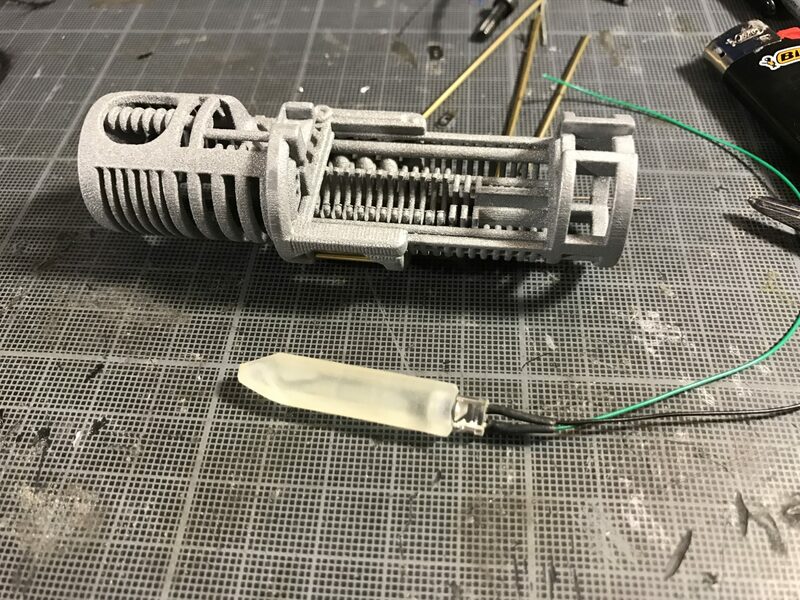 Here we have used the 3D printed crystal with a modded (lenght reduced) 5mm RGB led. 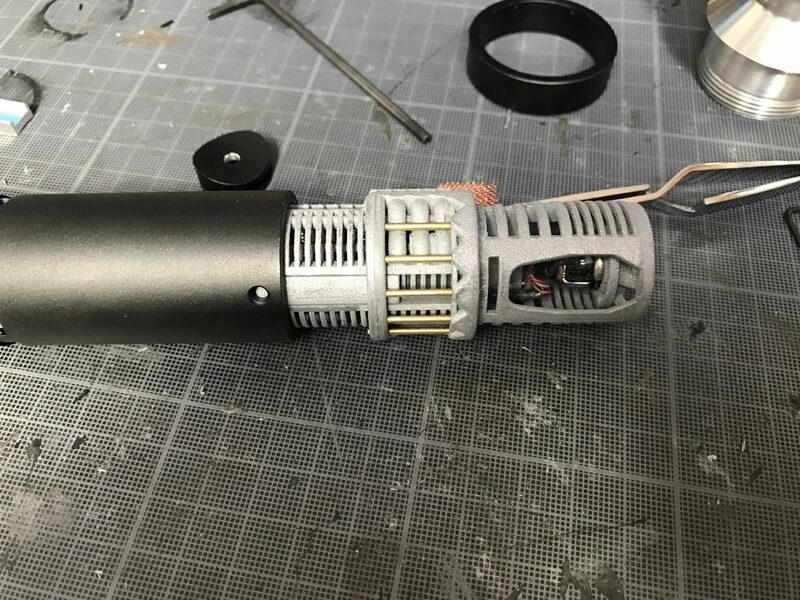 Step 6- Wire and install the 14500 battery. 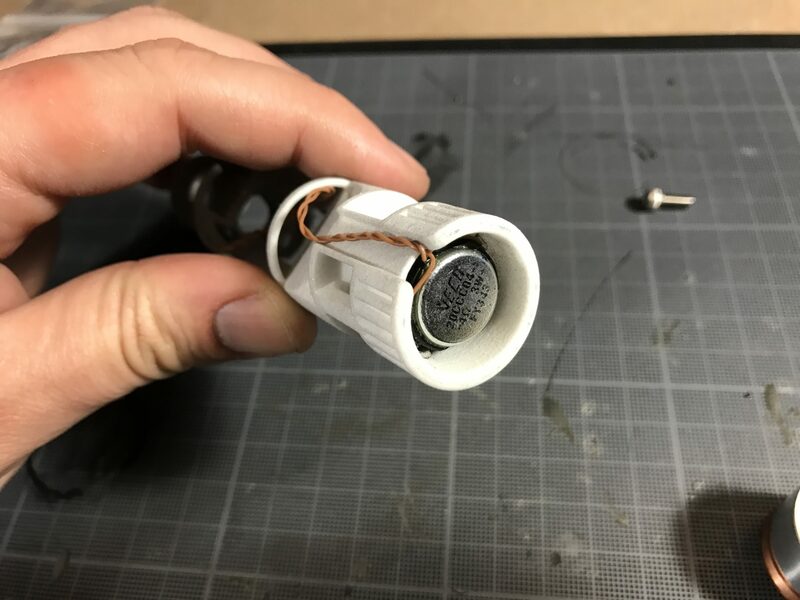 The battery insert in the battery holder as shown below. 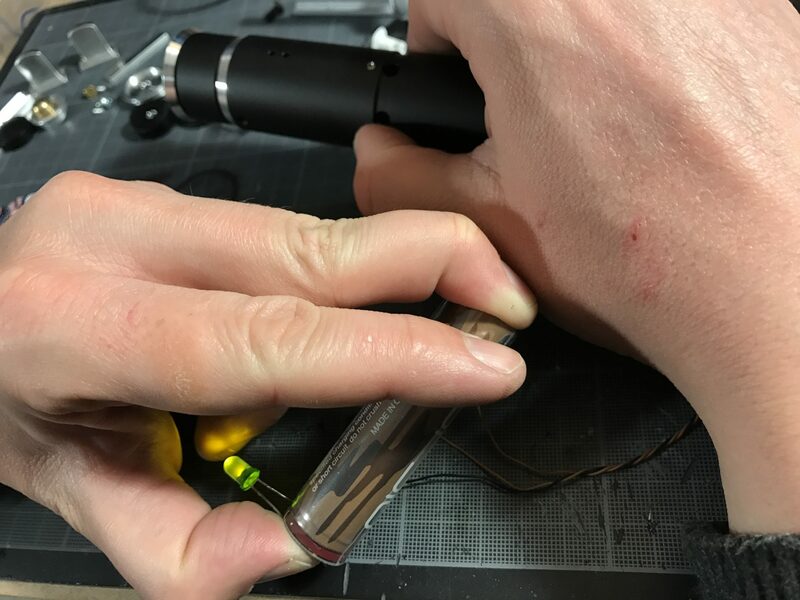 Notes: Always run some tests during the install to check everything work fine. 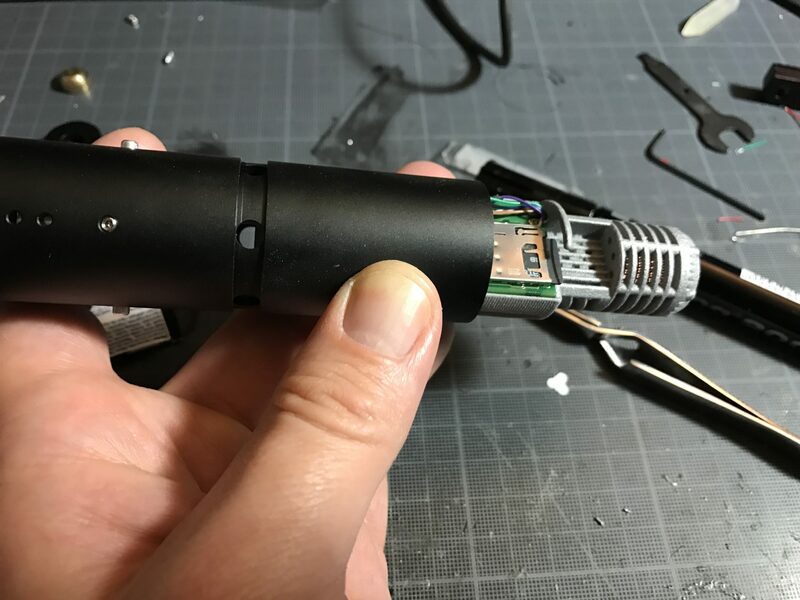 Step 7- Install the soundboard. 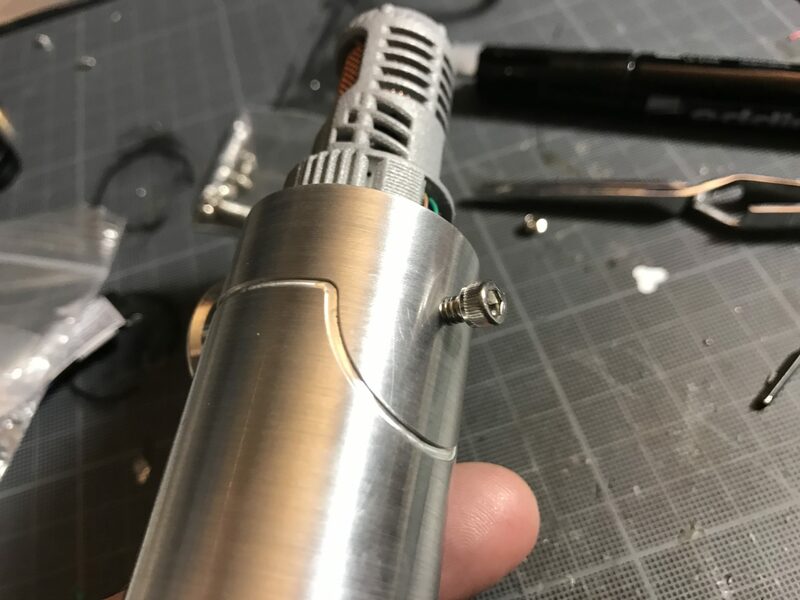 Notes: Regarding Prizm, as usual, the yellow capacitor is an issue as there isn’t enough space for it to fit properly. 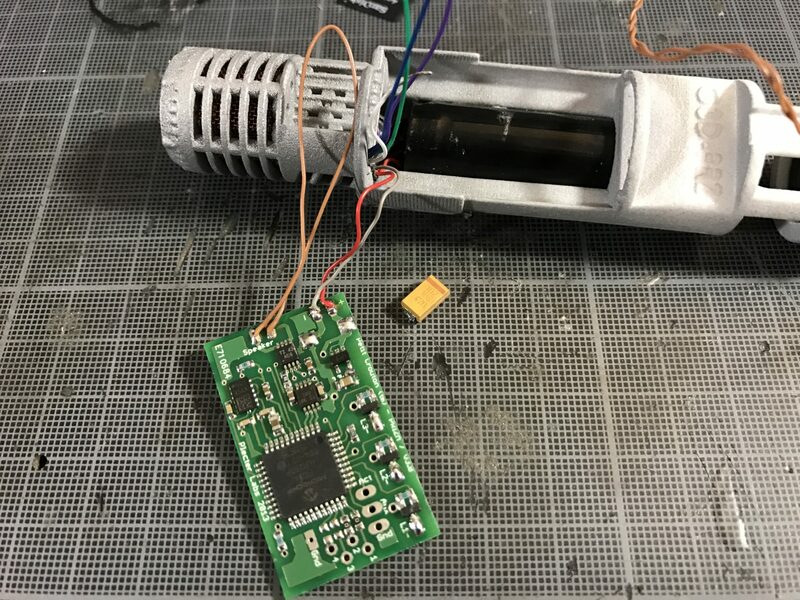 To work around this, we’ve un-soldered the capacitor, added wires to it and located it in an area where it would no be an issue (check the second picture below, the capacitor is in the bottom left corner or the soundboard slot). 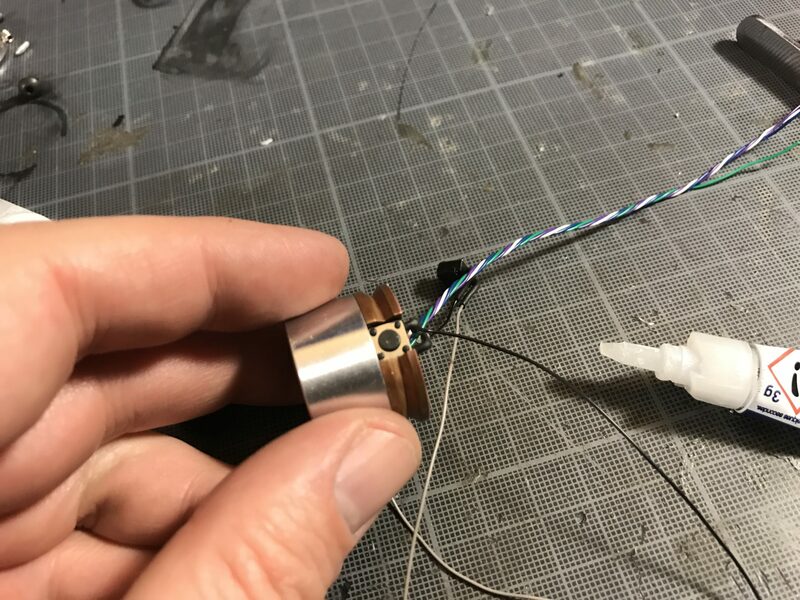 Step 8- When adding the soundboard to the chassis, make sure the speaker and accent leds wires pass through fine in the dedicated hole, so that you can continue the wiring. 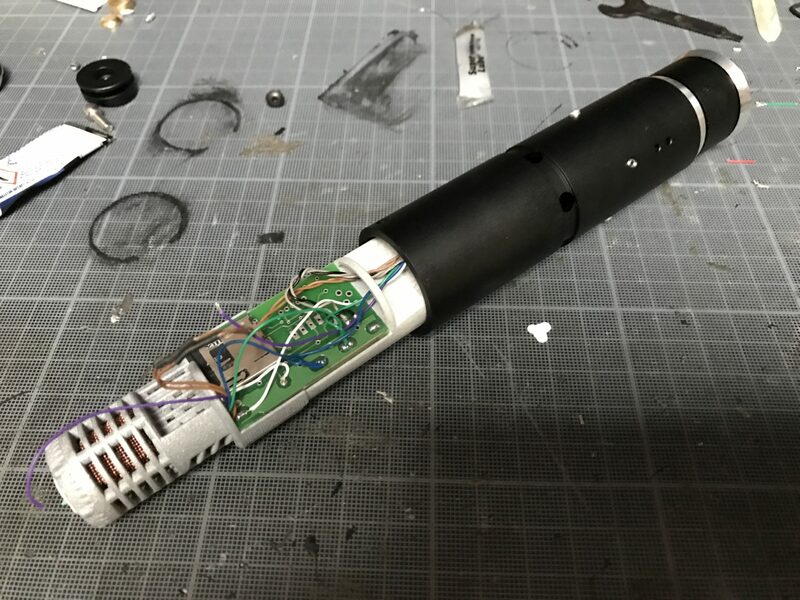 Step 9- Insert the chassis into the hilt and finish the wiring of the switches and main led. 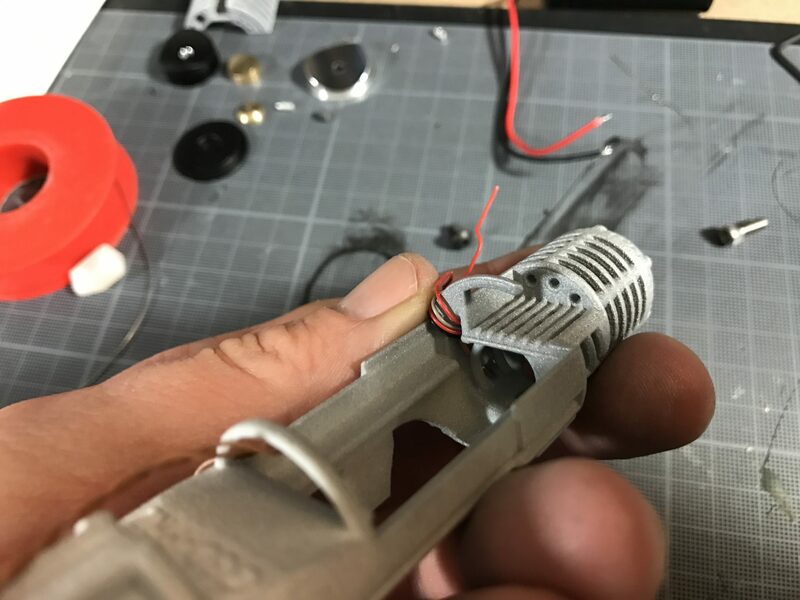 Make sure the wires go through the dedicated channel, and pull the switches and Led wires out from the back while inserting the chassis (to minimize the space needed after the led module and to align with the sound holes properly. 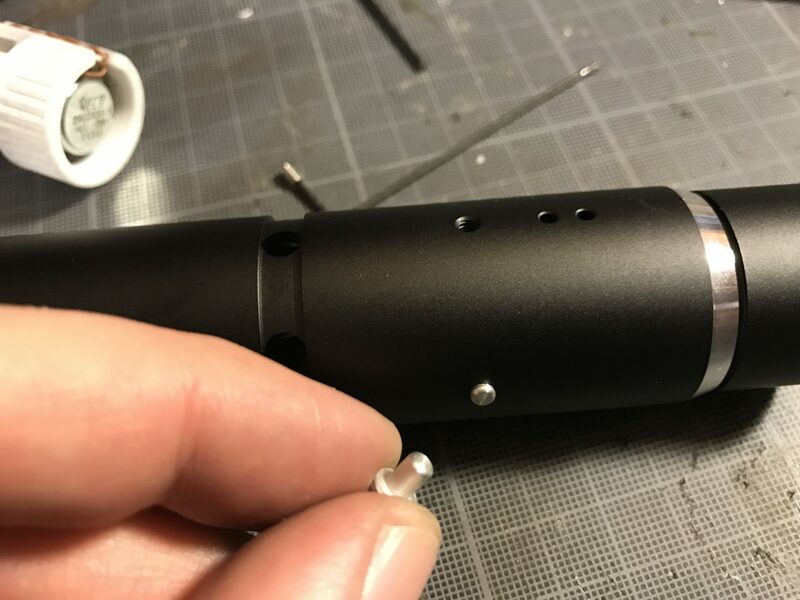 Step 10- The chassis has a hole that lines up with the Covertec screw (the screw will secure the chassis). 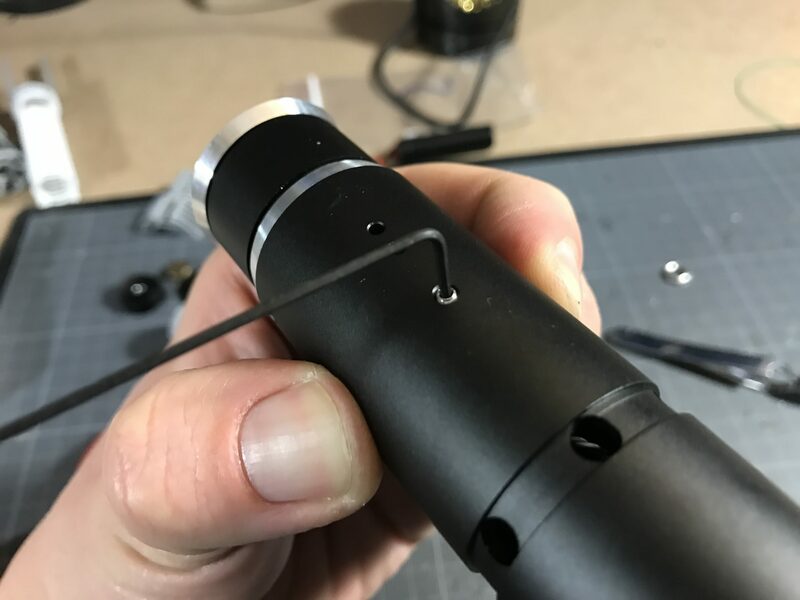 Add the covertec screw to lock the chassis/black tube/shroud assembly, then add the big thumb screw assembly. 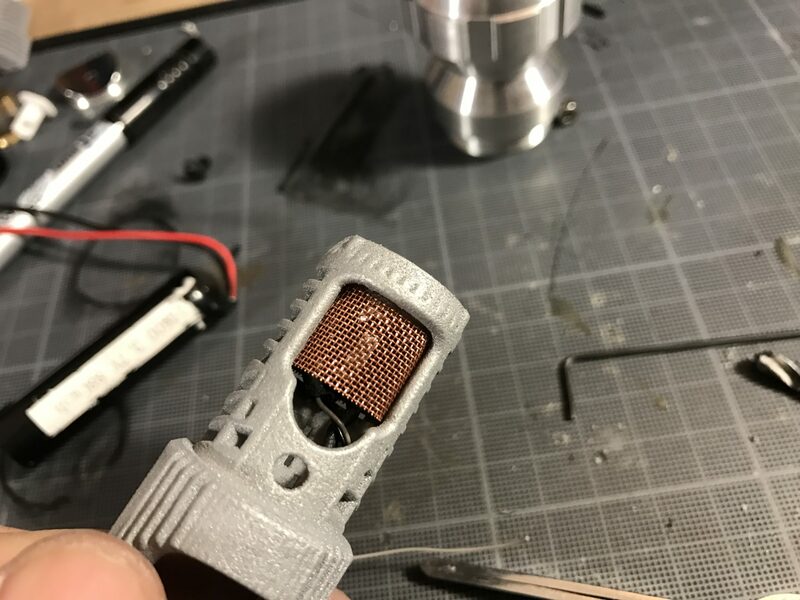 Test again, and make sure everything is working fine before going to the next step. 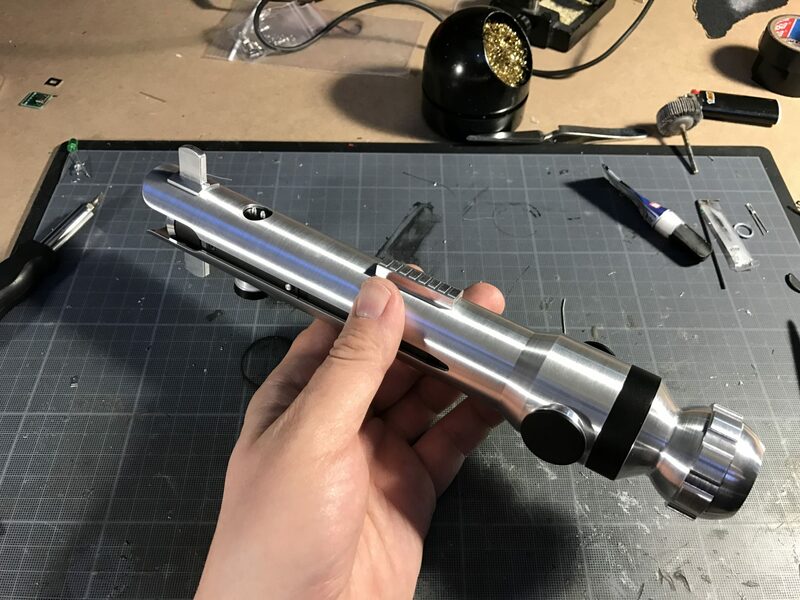 Step 11- Finish the hilt by gluing the little aesthetic parts.